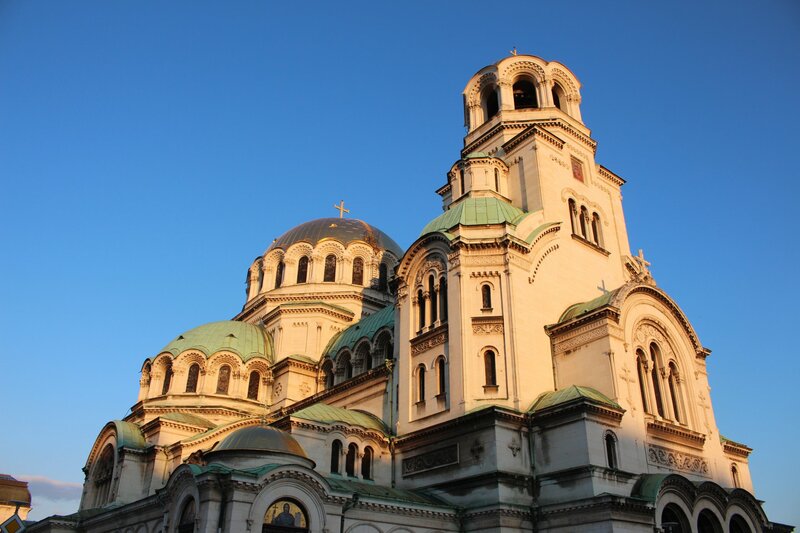 Three days in Sofia has been an absolute pleasure, but our time here has come to an end. 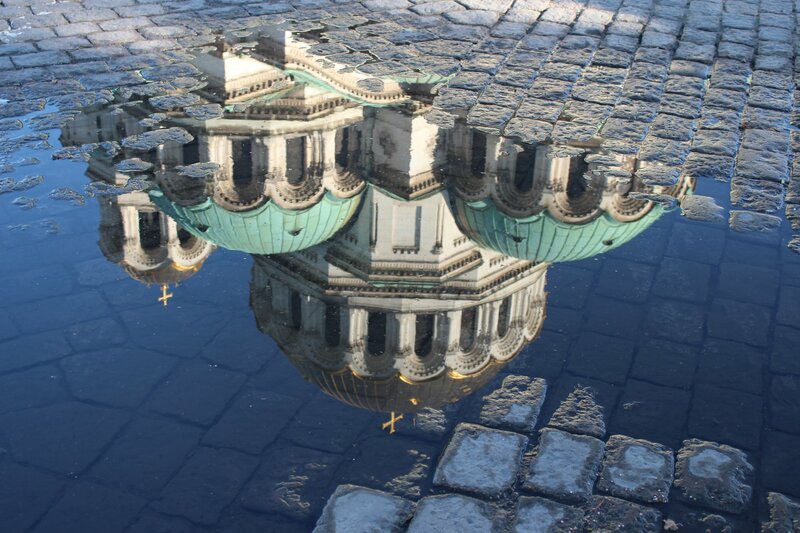 It is a quite stunningly beautiful city with some incredible architecture, lovely green spaces and a friendly vibe so we leave with a little regret on our journey back to normality! It is worth noting that the latest editions of the guide books that I could find were out of date, having mostly been written before the re-organisation of the national art collection (for example, referring to the national gallery building as the national gallery of foreign art, which really doesn’t reflect the current arrangement at all), the opening of the Sofia City Museum or the unveiling of the remains of Roman Serdica. 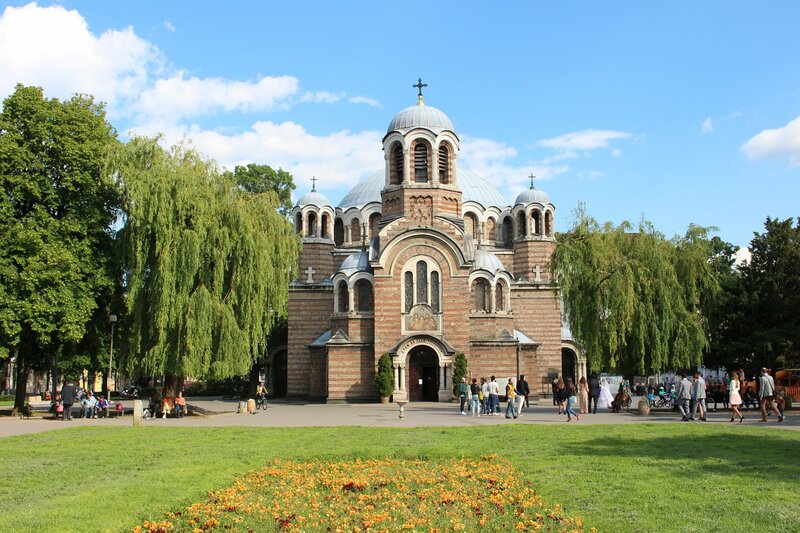 The In Your Pocket guide to Sofia proved much more reliable, but it’s definitely a location where a bit of homework pays off! 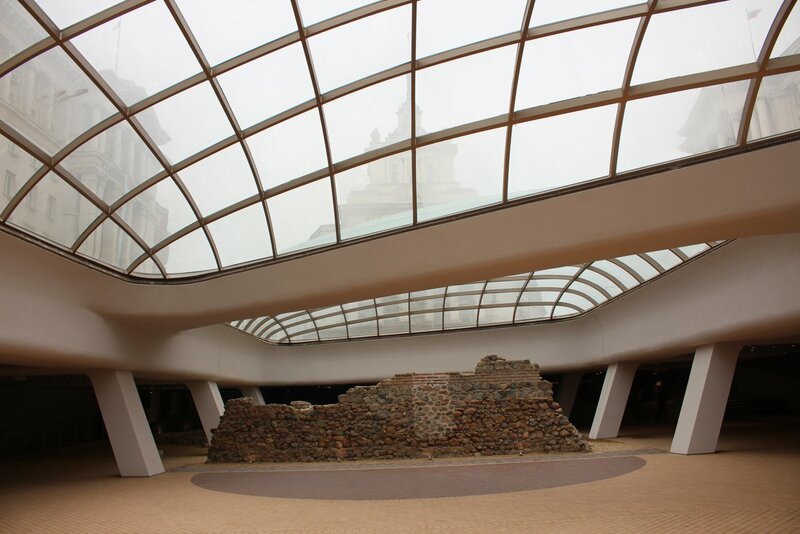 The newest attraction in the city is the remains of Roman Serdica, which opened to the public in April 2016. 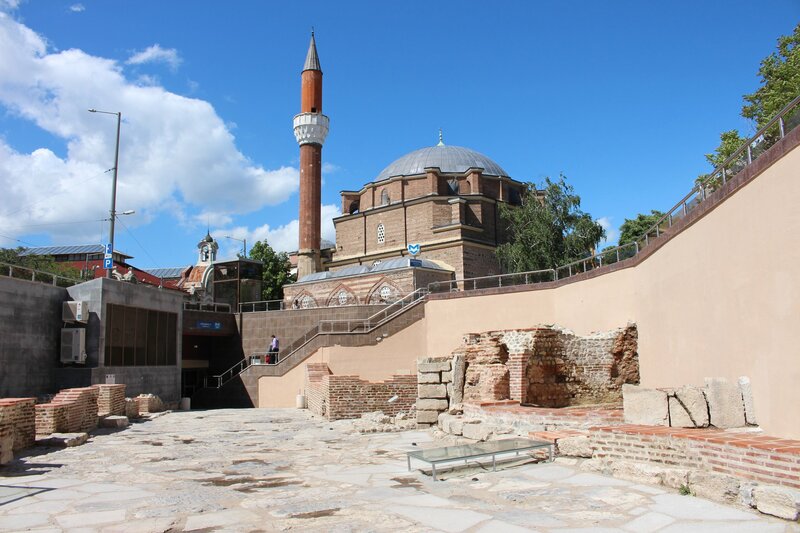 This 9000 square metre archaeological complex is located below street level and accessed from the metro station at Serdica or from staircases around the Largo. There were some impressive finds, such as the remains of an early Christian basilica, but most of the space is made up of underwhelming streets and buildings. The presentation is rather odd, if I am honest, with modern walls built on top of the Roman walls to preserve them. It’s an interesting addition to a great city, but it’s not going to challenge any of the existing sites (unless there is more to this complex than I discovered). 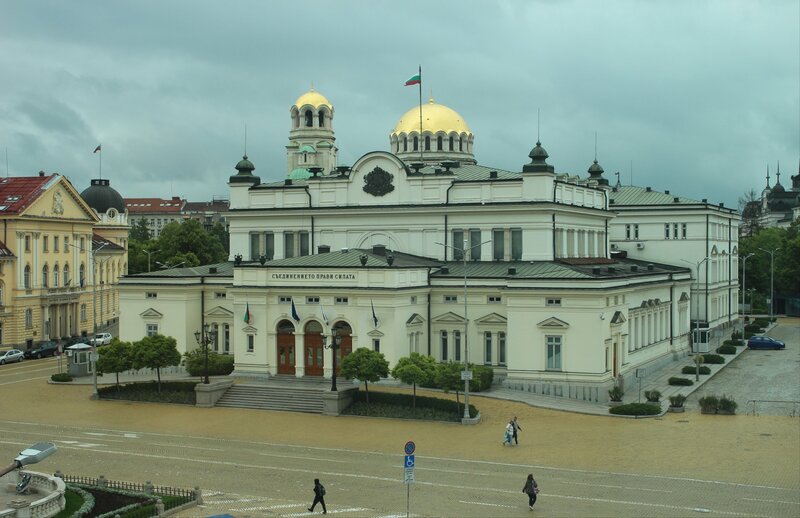 Our visit to Sofia was complicated slightly by the Museums at Night festival on Saturday, which meant that most art galleries and museums did not open during the day we had earmarked to see them. Admission was free for the evening, though this inevitably resulted in long queues to get in. The National Gallery – Square 500 was a revelation and one of the highlights of the trip. The gallery is arranged as a chronological walk through Bulgarian and European art, but it was the Bulgarian art that appealed to me. 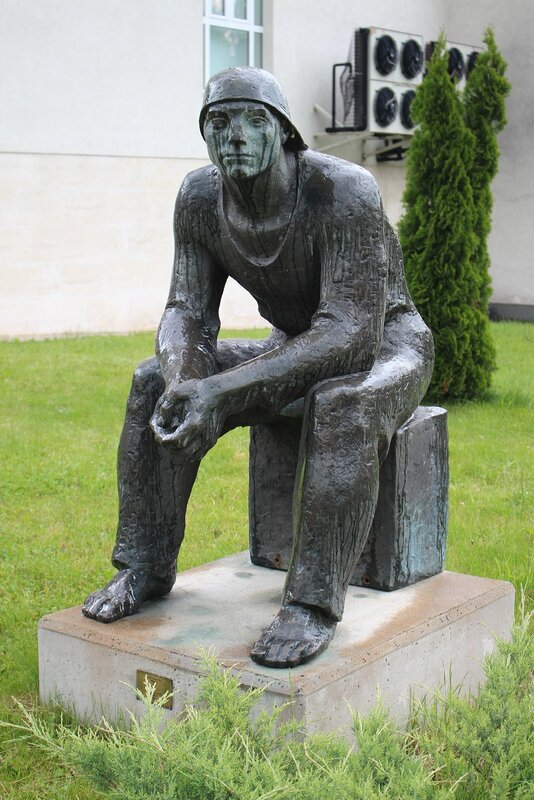 It’s tricky to pick out any highlights from the national collection, but three pieces that stood out were ‘Motorman’ (1932) by Funev, a relief of a locomotive driver hanging out of a window looking at the way ahead; ‘Respite’ by Kirkov, a rather downbeat black and white portrait of a man smoking a cigarette; and ‘Stop along the way’ (1967) by Gasharov with the striking image of a man in a flat cap at a bus stop with a small white toy wooden horse on wheels in tow. There were many other arresting images, including some lovely industrial compositions. The Sofia City Museum, housed in a former bath house, was quite splendid at presenting some of the most fascinating moments in recent Bulgarian history, with some astonishing pieces of religious art (such as a marvelously colourful prelates throne from the old church at Kremikovtsi with arm rests shaped like open mouthed dogs dated to 1814) in a space cleverly adapted from the bath pools themselves. A particularly strong collection of material in the Sofia City Museum covered the short history of the Bulgarian royal family, including a surprising set of possessions that belonged to Tsar Ferdinand I: a clock given by Queen Victoria, a writing desk given by Otto von Bismarck and Marie Antoinette’s royal carriage (used for his marriage, if I remember correctly). There is also a rather lovely souvenir cup given to Ferdinand I by the Ministry of Railways in 1912 to commemorate the 25th anniversary of his accession to the throne. Well worth a half-hour queue to get in! 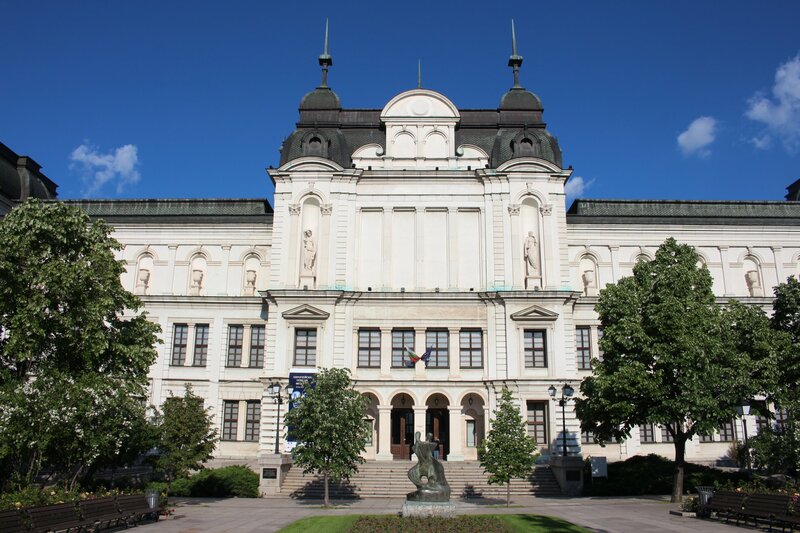 The combination of interesting sights from the communist era, fantastic architecture and great galleries/museums makes this a much underrated destination for a weekend or longer. 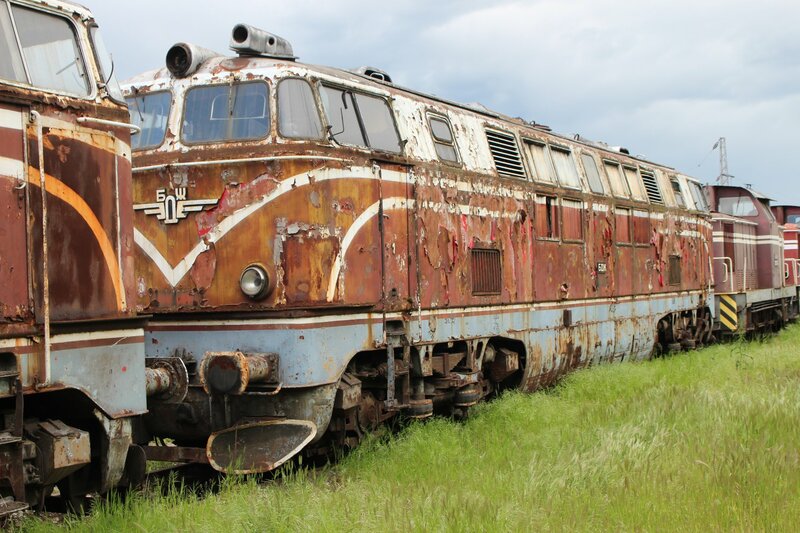 My only regret is that I didn’t look into tours from Sofia out to the Buzludzha Monument before it disentegrates completely! 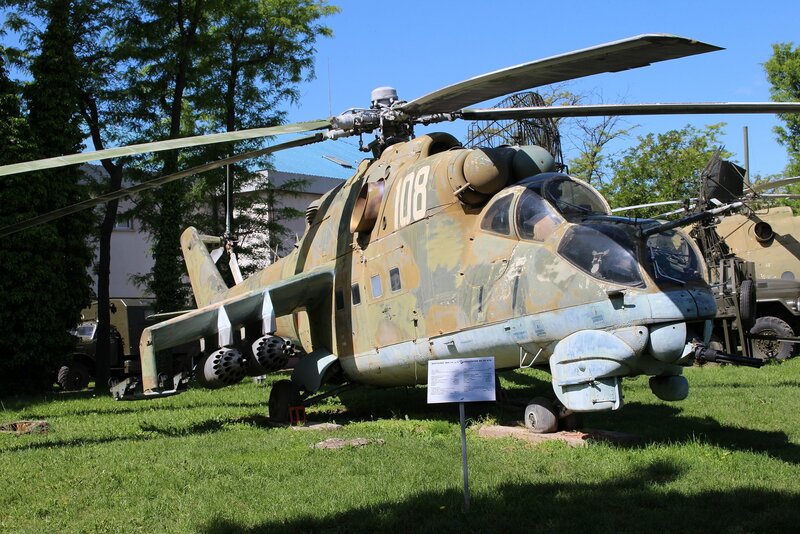 The National Military History Museum in Sofia offers a comprehensive account of the complex history of the region over four floors, covering uprisings and wars from ancient Thrace to the present day. 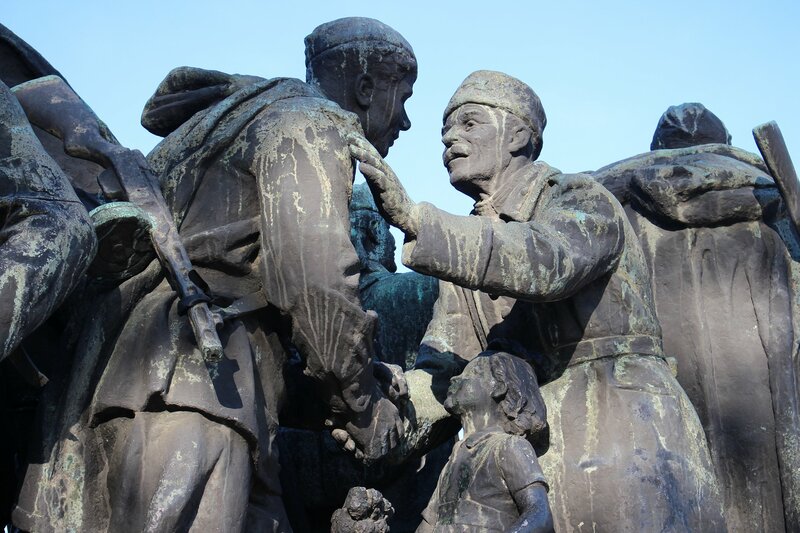 It was particularly fascinating to learn about those periods of Bulgarian history that I’ve never really been aware of, such as the Russo-Turkish war of liberation (1877-78), the war with Serbia (1885-86) and the Balkan wars (1912-13). 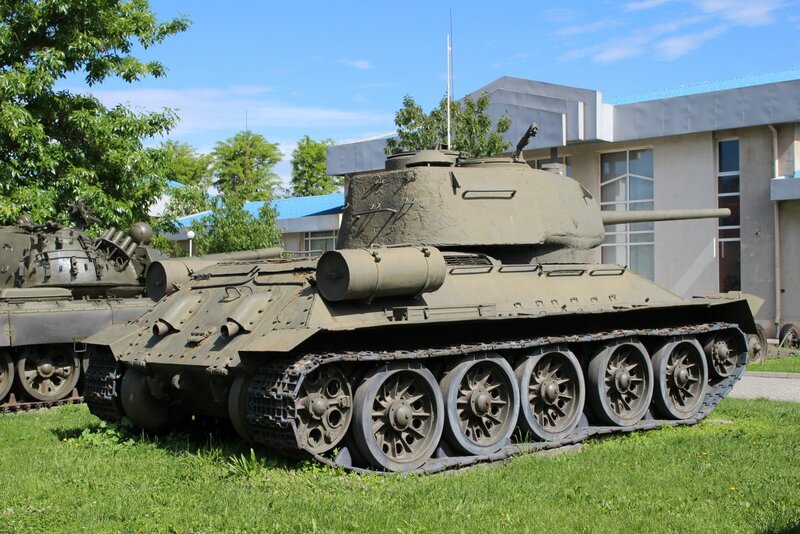 However, the main draw of this museum is the impressive display of military hardware in front of the entrance and spread across the extensive grounds inside (40,000 square metres of outdoor display space in total). 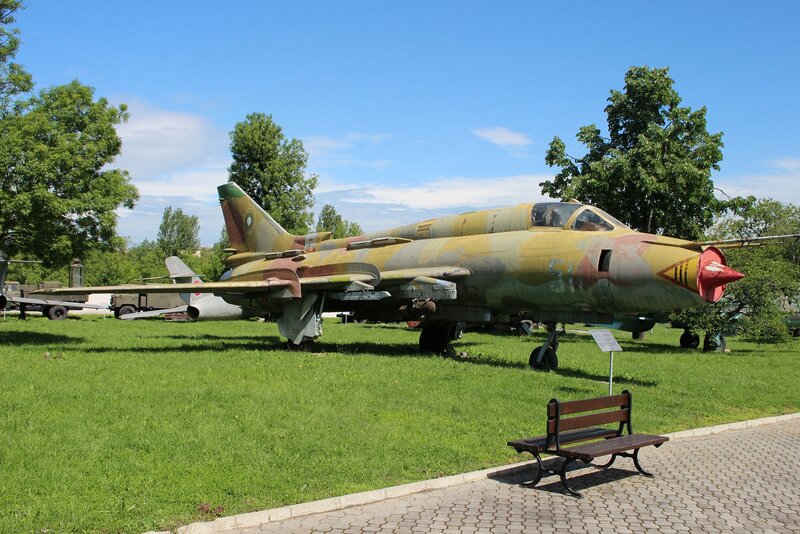 The collection includes some terrific examples of ex Bulgarian Air Force MiG and Sukhoi fighter jets, plus plenty of German and Soviet tanks. 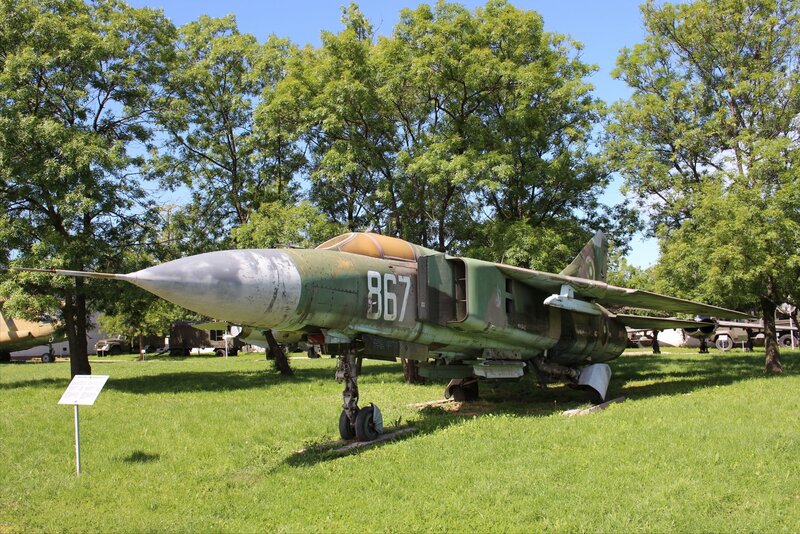 The grounds are beautifully maintained and the exhibits clearly kept in good condition. 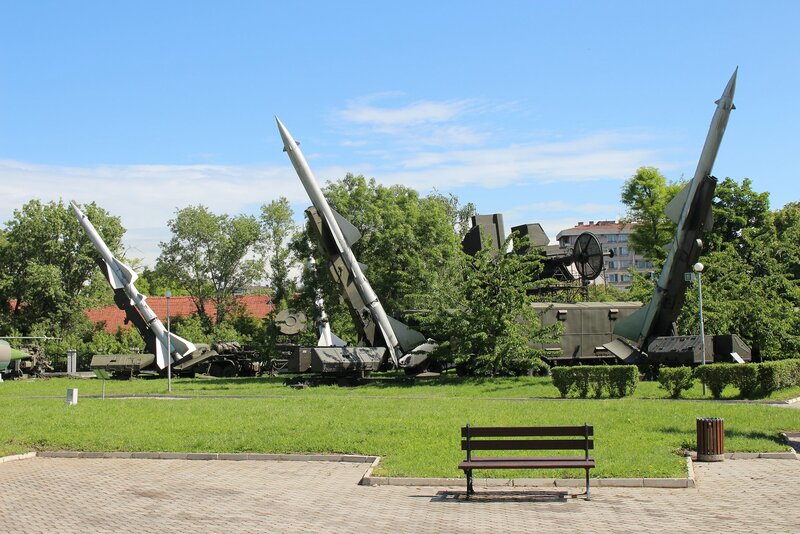 Most chilling of all was the display of a cluster of missiles that once pointed westwards from silos just outside Sofia, including decomissioned OTR-23 Oka ballistic missiles (better known to the west by the NATO name of SS23 Spider). It really is quite disconcerting to see these weapons of mass destruction laid out in a pretty green park with benches as if they were no more harmless than the cats wandering amongst them. 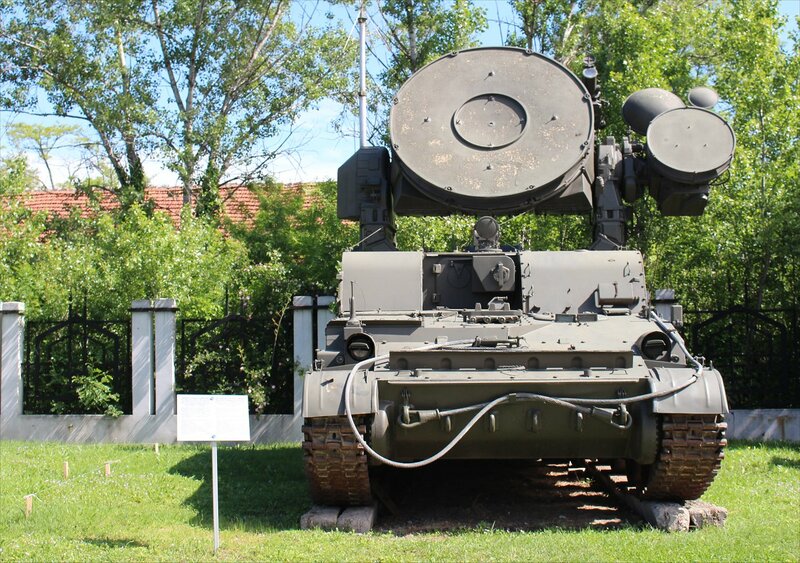 Some of the exhibits were in use with the Bulgarian army until relatively recently, such as the Anti-aircraft missile complex 2K11M SA-4 “KRUG”-M1 which was only retired in 2002. This mobile armoured guiding station for SMR 1S32 missiles could trace targets, including supersonic aircraft, in any weather conditions. Practical information. 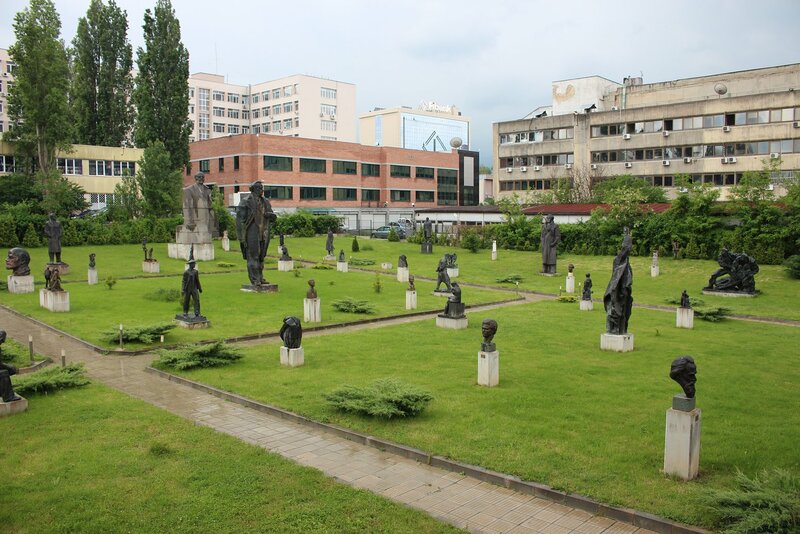 A walk to the museum from St. Kliment Ohridski metro station took me about 20-30 minutes with the unexpected sight of an interesting memorial on Bulevard Tsarigradsko Shose along the way. On the way back I took the route via ul. 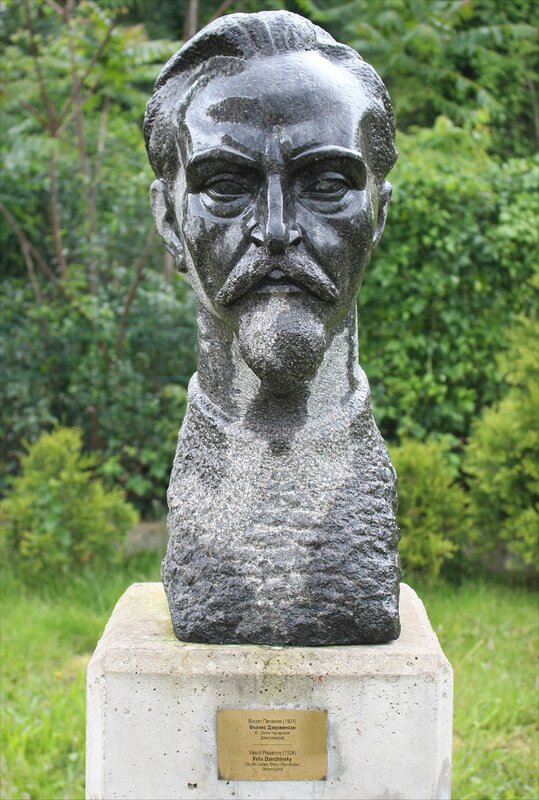 Tsar Ivan Asen II which was a more pleasant option. 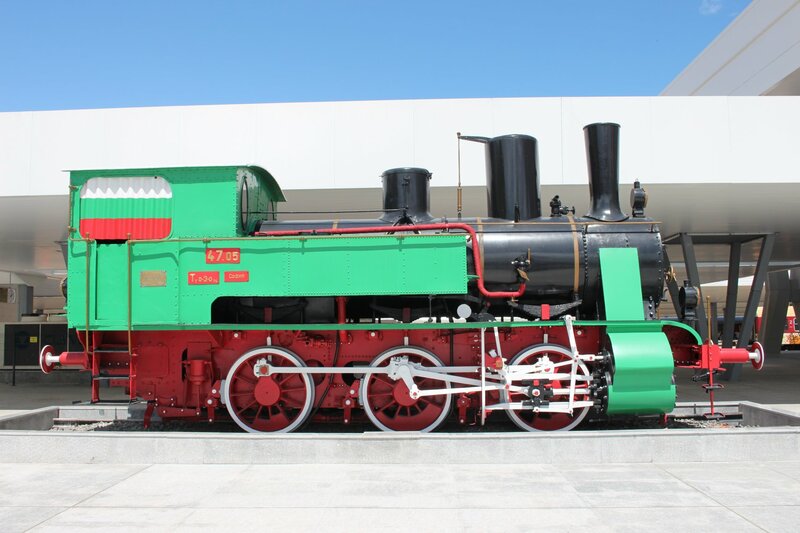 Public transport options are listed on the museum website. 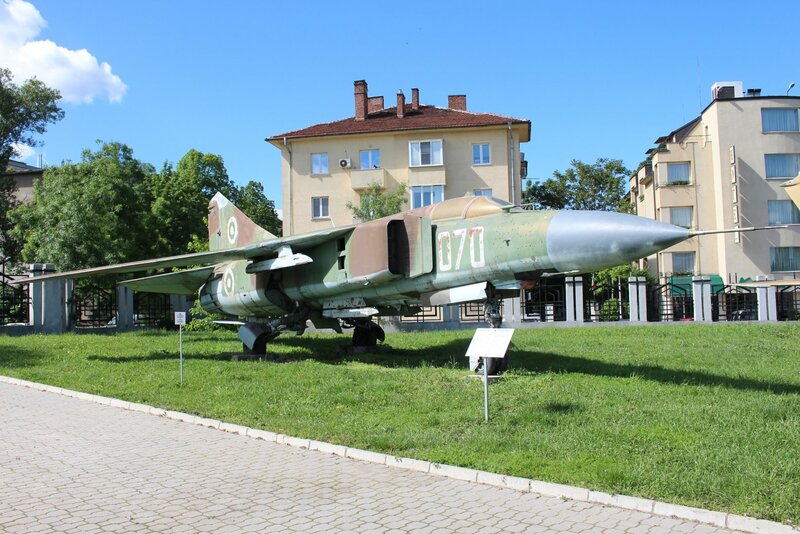 There are two entrances to the museum – one in Cherkovna Str and the other in Han Omurtag Str. 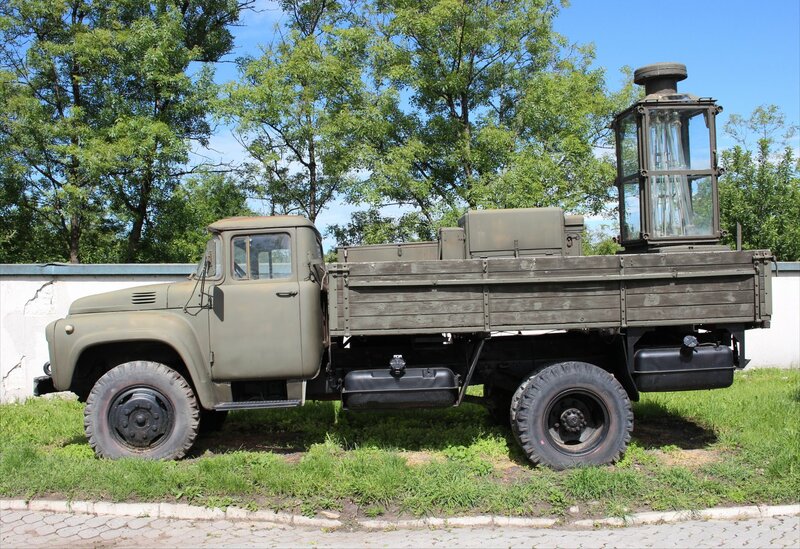 The official address for the museum is 92 Cherkovna Str. Overall, I would say that the museum was much better than I had expected. As you take your walk through history there are some fantastic paintings and it would be worth the price of entry to see these alone. On the top floor there is aslo a superb display of decorations. I only had an hour and a half to stay in the museum but I could have spent so much longer! 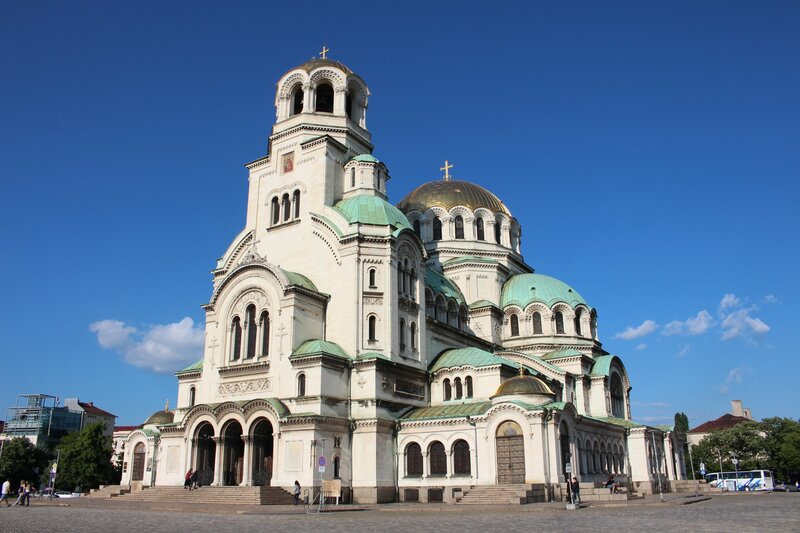 The Alexander Nevsky Cathedral is a monumental structure that you can’t help but see everywhere in the books, brochures and guides for Bulgaria. 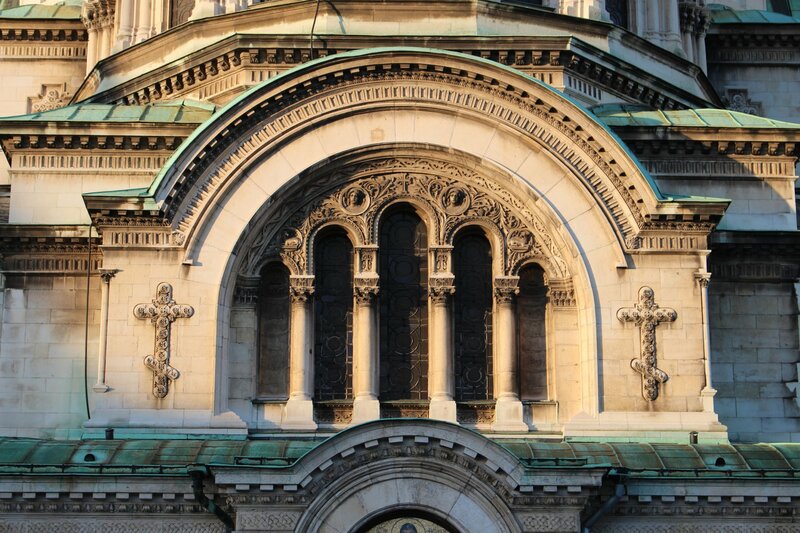 No wonder, it is a mesmerising confection of arches and domes that catches the light beautifully throughout the day. 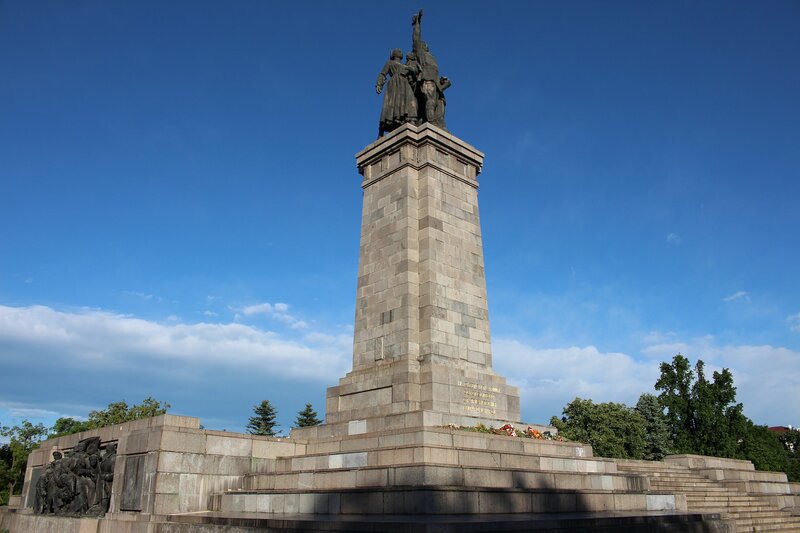 It was built between 1882 and 1924 to honour the Russian soldiers who died during the Russo-Turkish War of 1877-1878 (an inscription professes love and gratitude to the Russian people for the Liberation of Bulgaria in 1878). 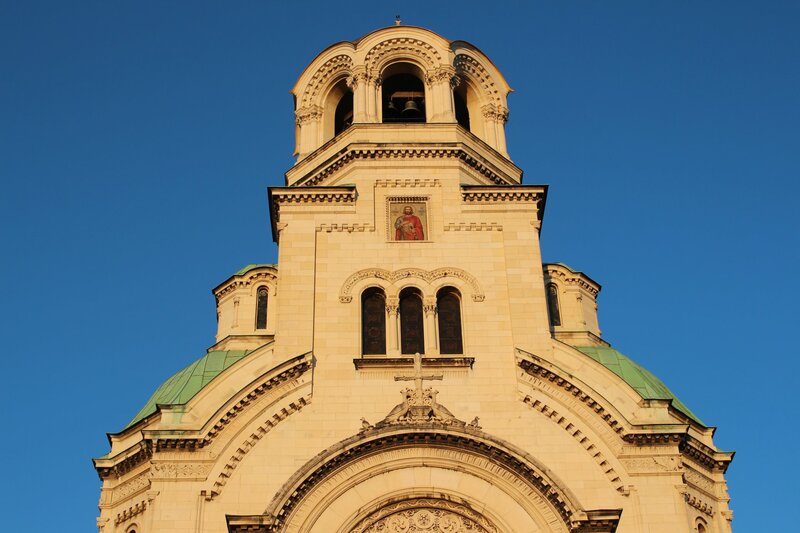 The cathedral is 50,52 metres tall at its highest point (the belfry) and covers an area of 3,170 square metres with a capacity of between 5,000 and 10,000 worshipers depending on which guidebook you read! Inside, the cathedral is quite dark at first but when your eyes adjust the riches are stunning to behold. You could spend hours in here absorbing all the detail. Colourful icons and wall paintings surround you at every turn, whilst beautiful chandeliers and painted ceilings tower above you. Stone lions lie the feet of columns, around the pulpit and flanking the dais of a remarkable throne built for Tsar Ferdinand. 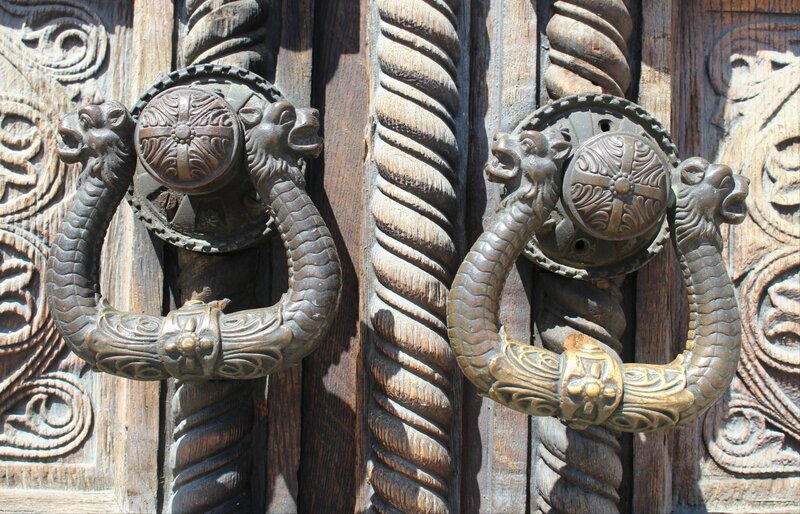 Even small details, inside and out, such as the door handles delight. It is quite impossible to describe adequately, but a splendid 360 degree panorama shows just how marvellous this interior really is. The icon gallery in the crypt (accessed from a door to the left hand side of the main entrance) is a complete contrast with its whitewashed walls and well lit interior. The riches contained inside seemed endless, including a wood-carved screen and many icons from Rila Monastery. A small exhibition in one of the antechambers included a couple of paintings depicting the rather surprising resurrection of a cow by St Modestus. It has to be said that it can be hard to keep track of what you have seen after a while, but it’s still well worth getting lost down here! 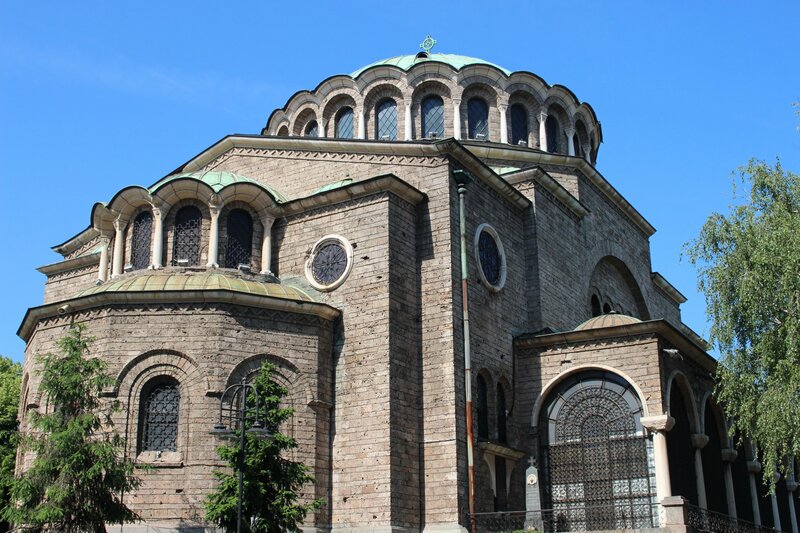 Sofia is a city of many remarkable places of worship, most of which have complex histories in keeping with the history of the country! 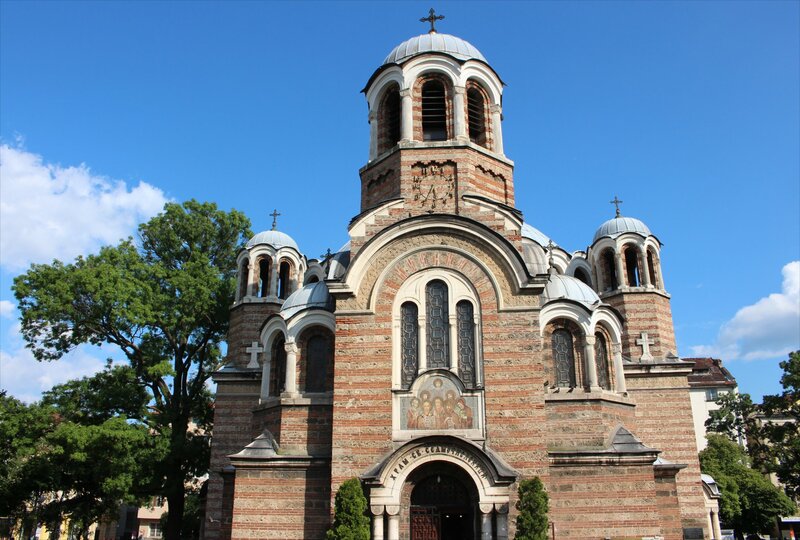 My favourite would have to be the Sveti Sedmochislenitsi church (Church of the Holy Seven) which was converted from an Ottoman mosque. 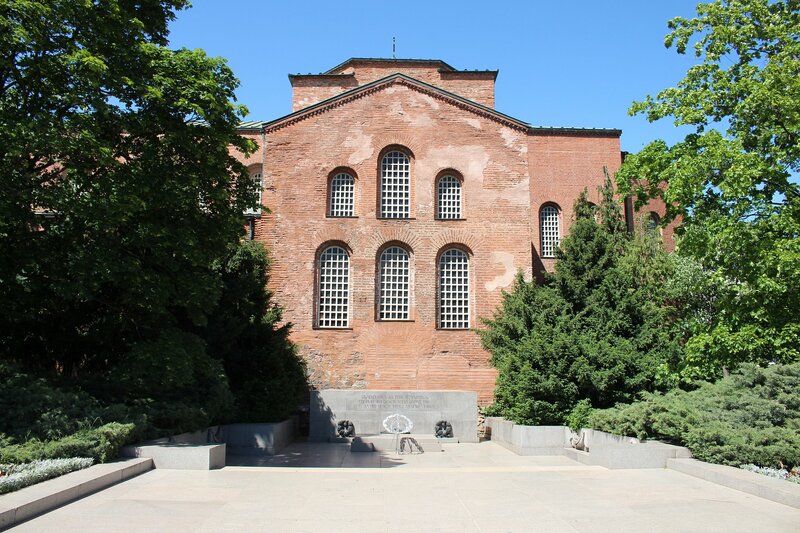 The so-called black mosque (a name derived from the black marble tiles used to decorate the minaret) was constructed in 1528 to designs by the grand architect Sinan. 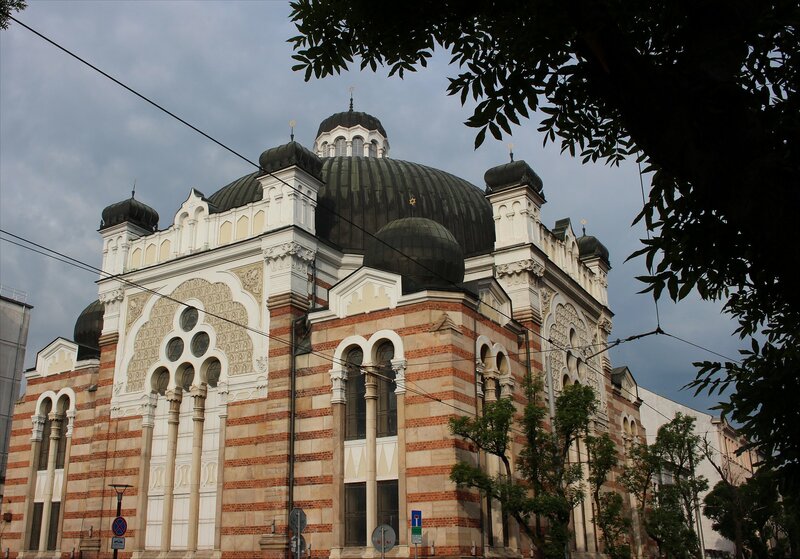 However, the mosque was abandoned after the liberation of Bulgaria in 1878 and the medrese (schoolhouse) was converted into a prison. 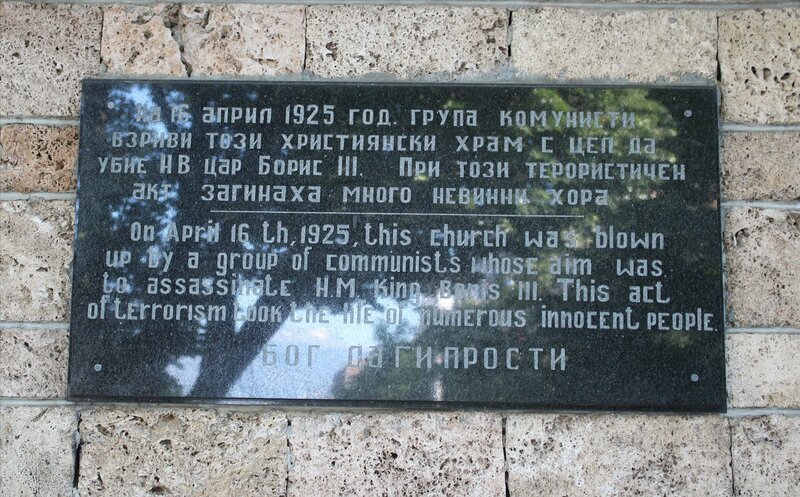 One of the prisoners, former Prime Minister Petko Karavelov, who had been incarcerated there between 1891 and 1894 proposed the conversion of the mosque into an orthodox church. 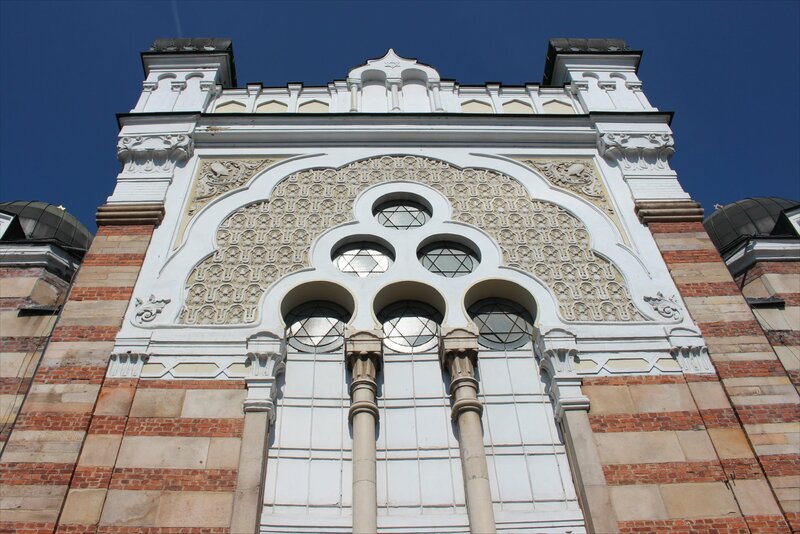 The work was carried out between 1901 and 1903 to a design by Alexander Pomerantsev which saw the exterior changed entirely. 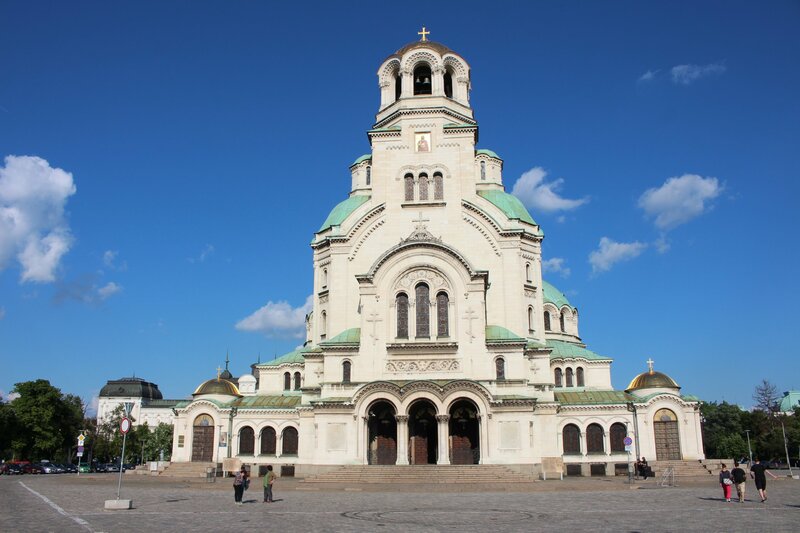 At the centre of the orthodox church is an impressive square space, the sole surviving part of the original mosque, capped with a dome designed by Milanov and Momchilov. The interior is quite beautiful, painted from floor to ceiling with colourful murals and a comparatively simple but effective iconostasis. 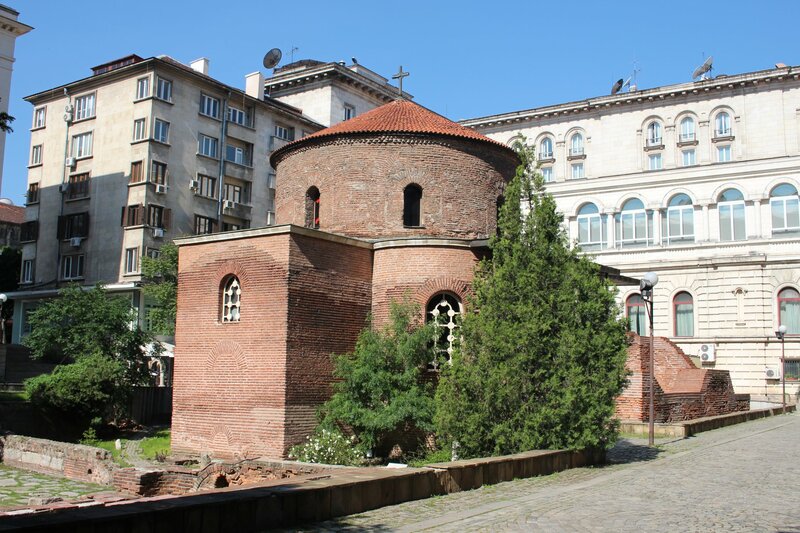 Other places of worship that I visited included the church of Sveta Sofia (a sixth century church which gave its name to the city), the church of Sveta Nedelya (a medieval church and the focus of a terrorist attack in 1925), the Russian church of Sveti Nikolai Chudotvorets (the interior was undergoing renovation when I visited and a temporary chapel had been set up, but you could still peer into the interior if you could cope with the solvent fumes) and the rotunda of Sveti Georgi (the oldest architectural monument in the city). 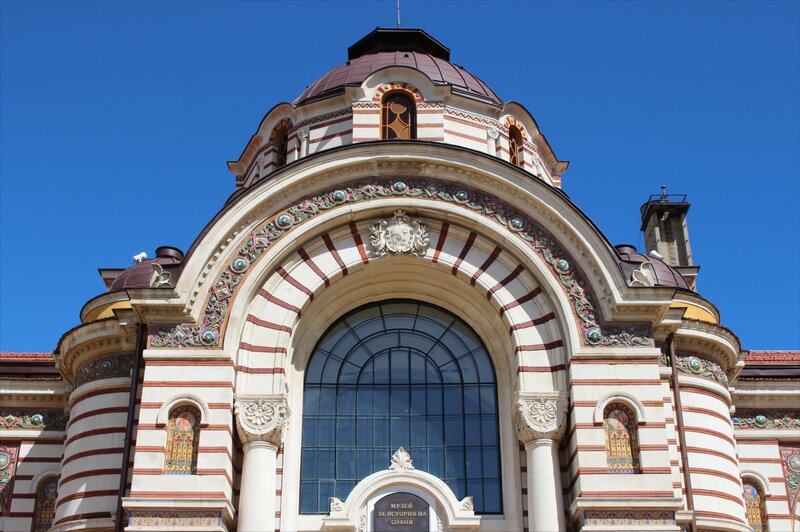 I also enjoyed the exterior views of the church of Sveta Petka Samardzhiiska, the Banya Bashi Mosque and Sofia Synagogue on my wanders. 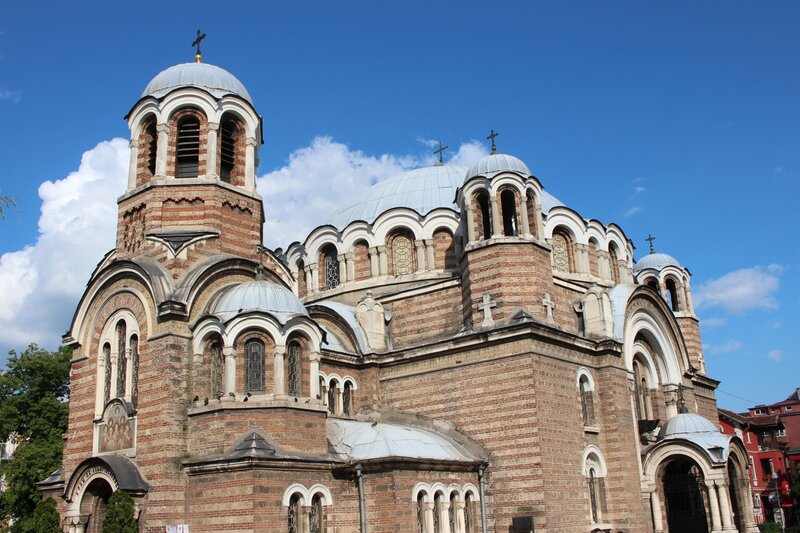 In short, Sofia’s places of worship each have something very different to offer and it is worth taking the trouble to explore them if you can find a moment when they are quiet (something that I found was much harder than I expected, stumbling on a seemingly never ending timetable of baptisms, choir practice, prayer sessions, services and marriages!). 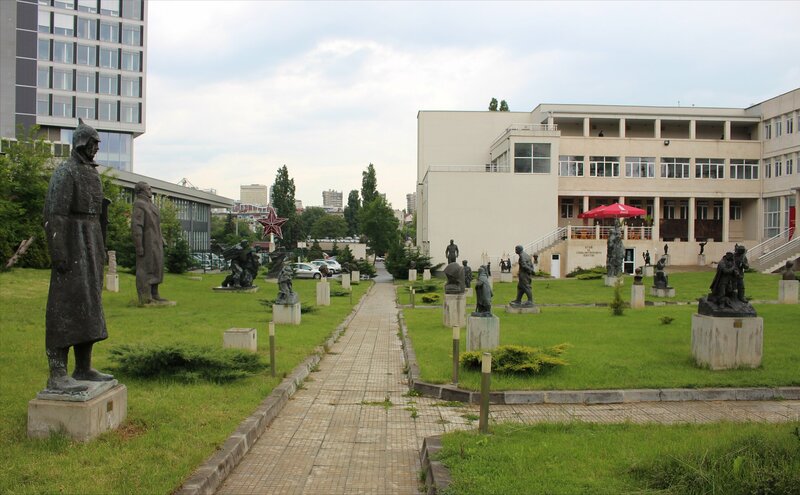 The Museum of Socialist Art, an initiative of the Ministry of Culture, opened its doors in September 2011 and has already become well established on the tourist trail in Sofia. There are three parts to the museum – an outdoor sculpture park, an exhibition hall and a video room. A cafe is located above the souvenir shop. 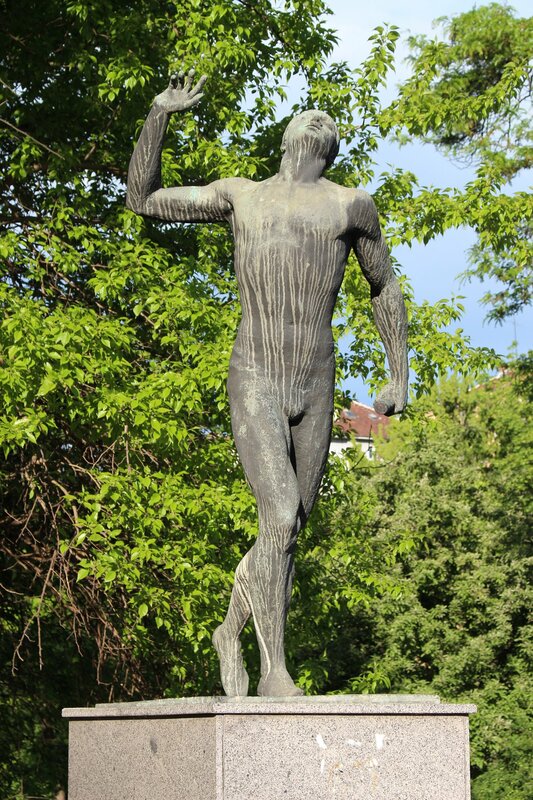 The collection boasts 77 works of sculpture from the socialist era (1944-1989) and over 60 paintings, but is still continuing to grow. 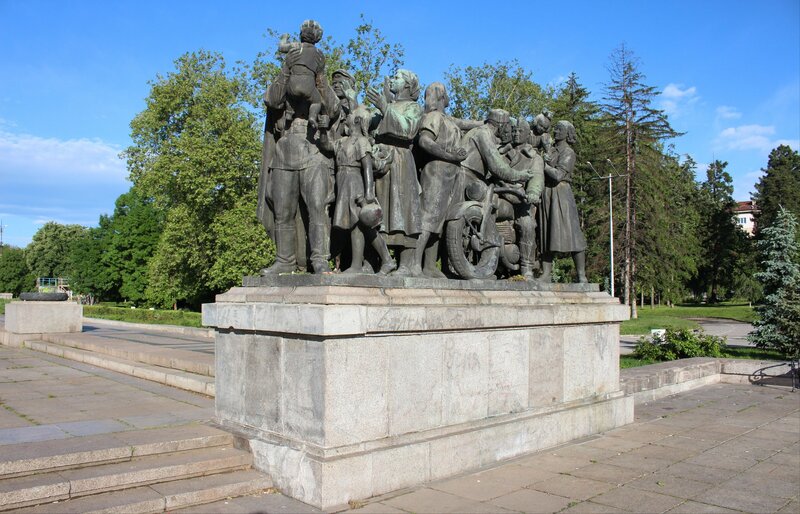 For example, the sculptures from the 1300 years of Bulgaria monument will be moved here when it is dismantled, assuming that it doesn’t fall apart first! Our visit coincided with a spell of heavy rain which was far from ideal for looking around the impressive colection of sculptures in the grounds. 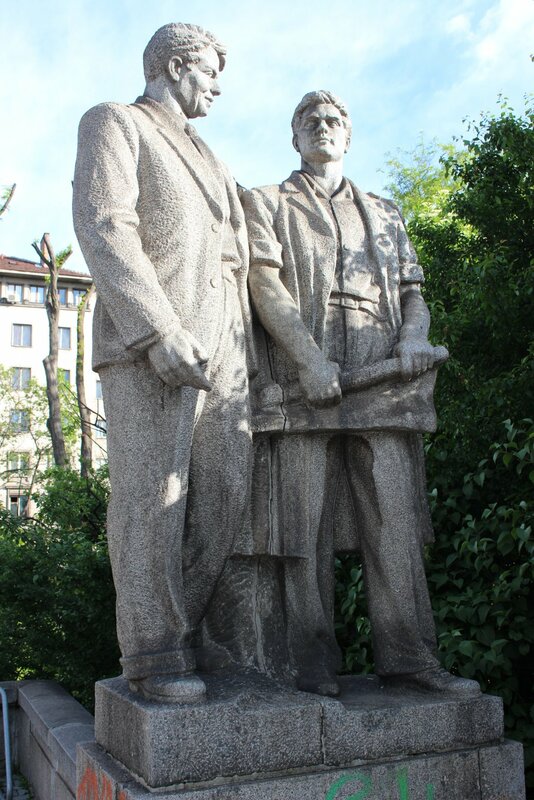 The statues of notable figures include Dimitrov, Lenin and Dzerzhinsky but I took as much, if not more, pleasure in the sculptures of the worker, such as Funev’s The Champion Worker’ (1958). At present the museum is hosting the exhibition ‘The image of the leader’ in its hall and this runs until November 2016. 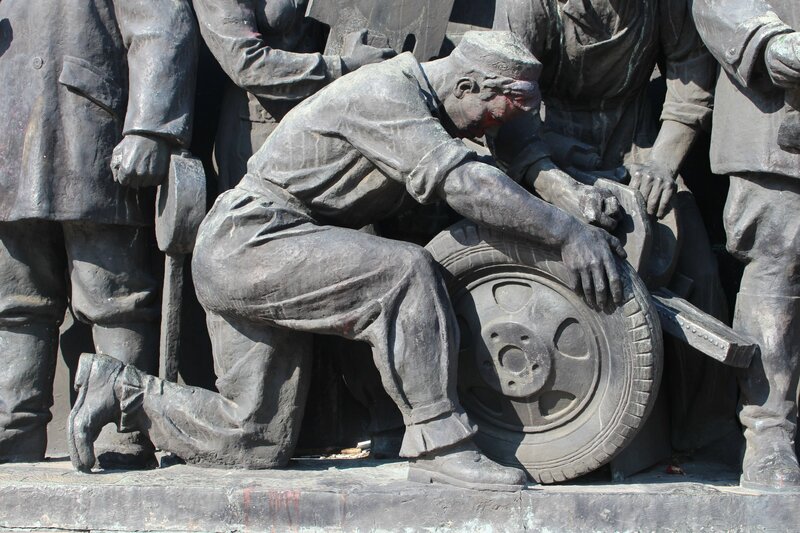 It offers up an interesting collection of paintings and posters that amply demonstrates the changing styles across the span of the communist era. The curator of the exhibition quite rightly questions whether some of the late works would have been acceptable a decade or two earlier. 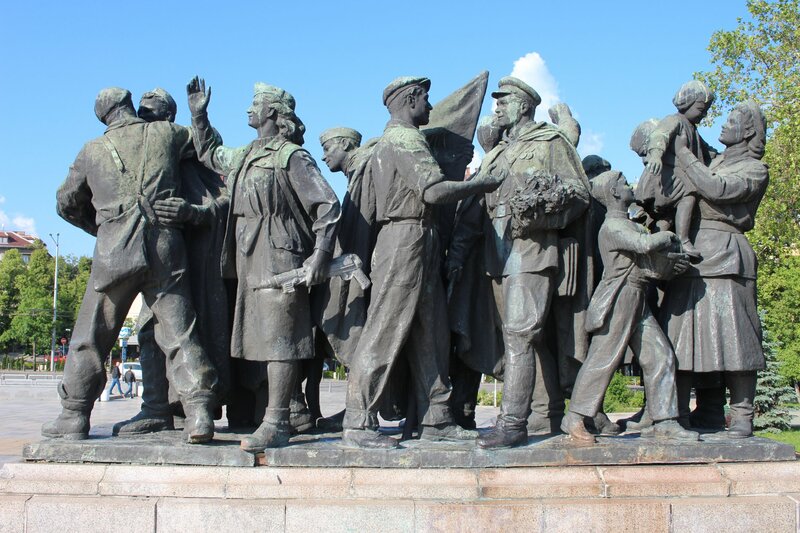 My favourite was a large canvas from 1951-53 entitled ‘The National Conference of the Winners of the Labour Cooperative Farm’ which shows the winners queueing up to be congratulated by party officials. The detail is superb, such as a chap with a pig under each arm waiting his turn. As all of this is going on the proceedings are being observed by portraits of Dimitrov and Stalin hanging in the conference hall. I think it captures the essence of the era, even if a modern audience is bound to see a layer of threat in these watchers that perhaps would not have been present for most people at the time. A small video room next to the souvenir shop offers a loop of archive footage from communist Bulgaria, interspersed with images of its demise (for example, footage taking us on a walk inside Dimitrov’s mausoleum is followed by images of its demolition). The footage had its comical moments too, such as when one model worker was praised for exceeding his targets by 1200% – I’m glad my managers don’t have such expectations! Practical information. 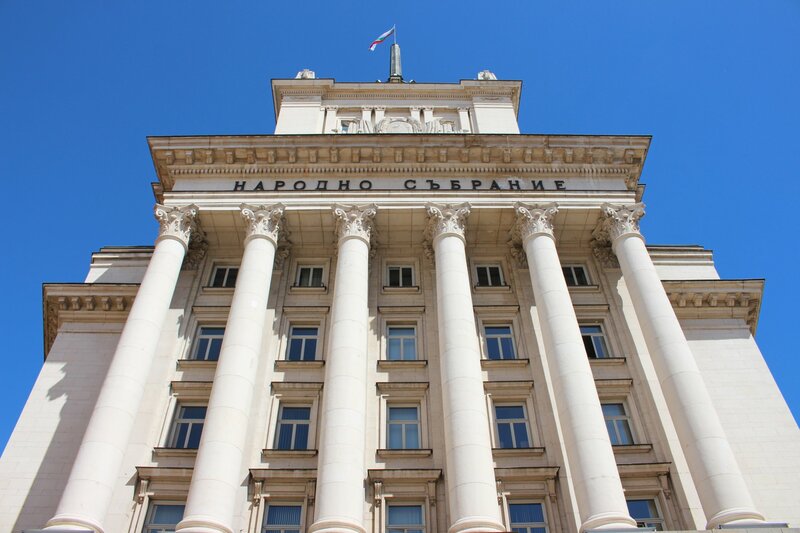 The National Gallery – Museum of Socialist Art is located at 7 Lachezar Stanchev Street which is easily reached from G.M.Dimitrov metro station. We followed the map and directions that a kind soul added to tripadvisor after the difficulties he encountered trying to find the place. Opening times are given on the national gallery website. Admission currently costs 6 Lev and catalogues for the current exhibition are available from the souvenir shop for 12 Lev. 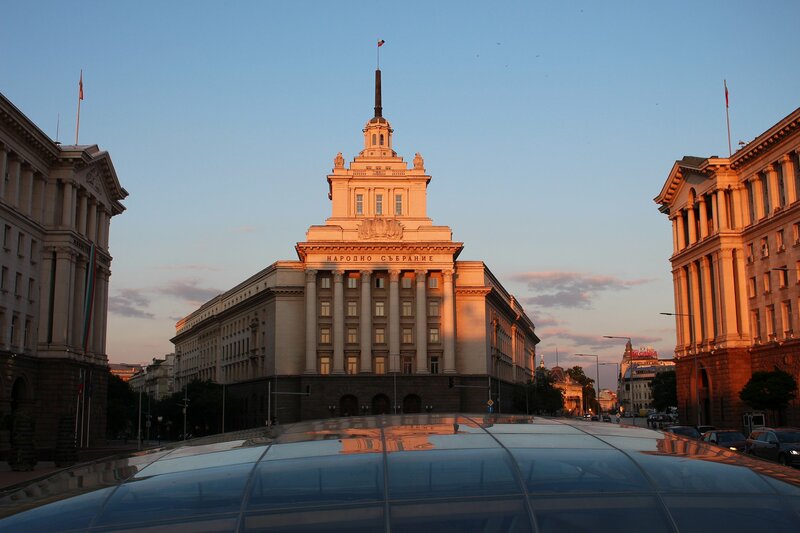 The Largo was the heart of Socialist Sofia, a square bounded on three sides by neoclassical buildings with the figure of Lenin facing the centrepiece – the Party House. 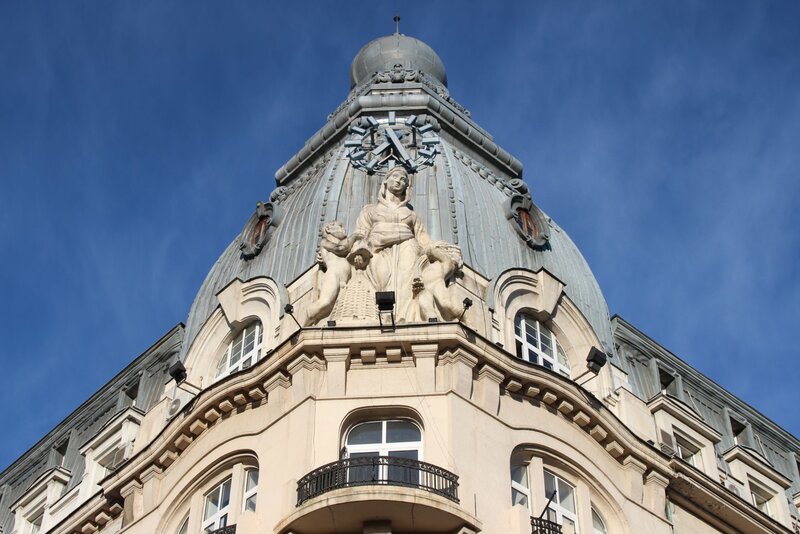 The symbols of that era have long since been replaced but there is no disguising the origins of these buildings. It can’t be any coincidence that you feel completely dwarfed by these buildings as you stand before them. 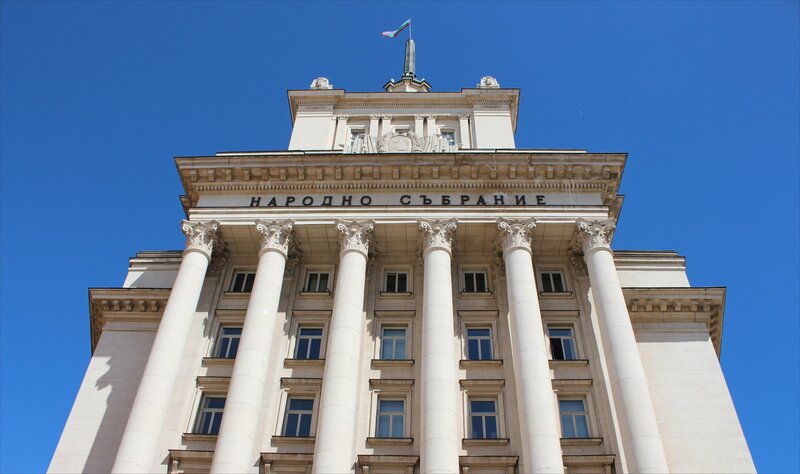 The construction of the Party House began on 16th March 1949, following the designs of Petso Zlatev and his team. Work was completed in 1954. The result is a giant, with a vast 40,000 square metre interior lurking behind its neo-classical colonnade. 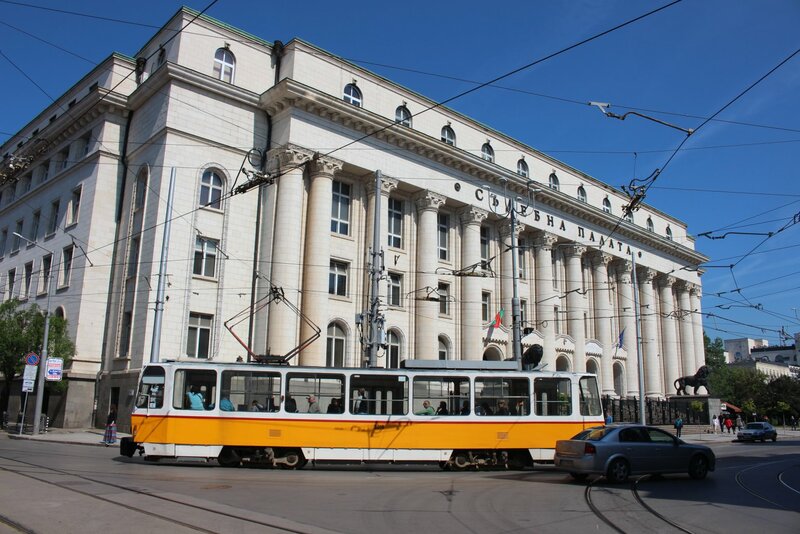 It remained the headquarters of the communist party until 1992, though the red star was taken down by helicopter in August 1990 after protests. 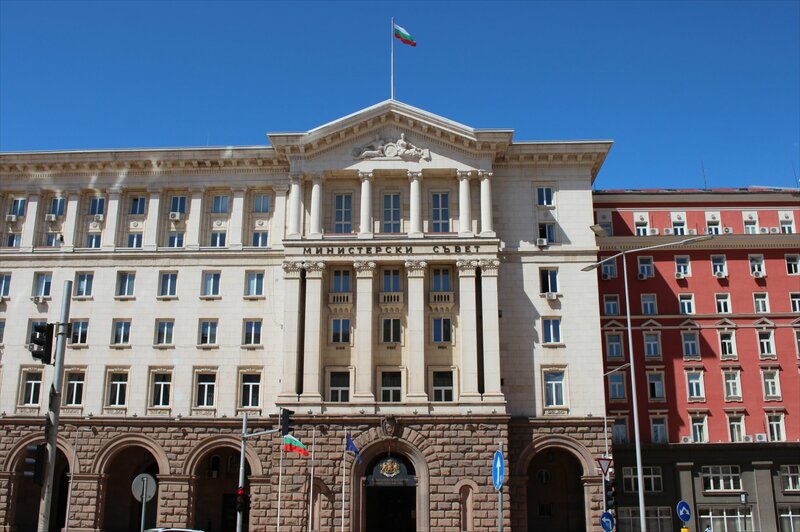 Today, the Party House provides office space for members of the National Assembly of Bulgaria, whilst the neighbouring buildings accomodate the TZUM department store, the Council of Ministers and the administration of the President’s Office. 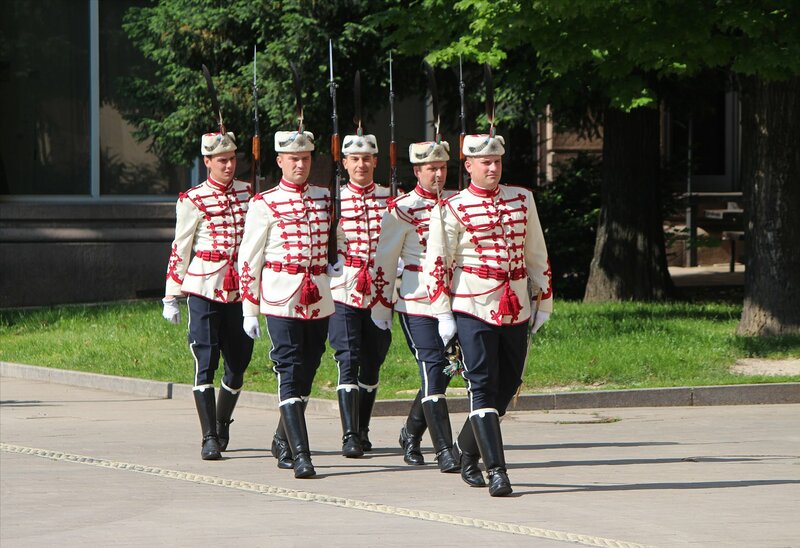 The entrance to the last of these is a particularly strong tourist draw with the spectacle of the hourly changing of the guard. 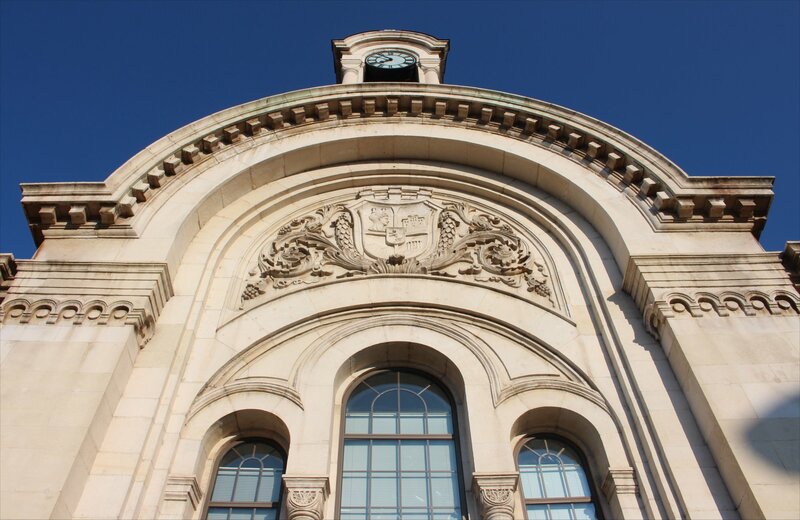 A few years ago there was talk of opening up the complex to tours under the auspices of the ATRIUM project, a programme funded by the European Union to explore the cultural potential of the architectural traces of totalitarian regimes. The interior looks fascinating, as blogger Agnė Drumelyte discovered in a pilot tour (see her post: My life in Sofia: Party House, NOT a nightclub) and as you can see in a short youtube video Largo of Sofia. Sadly, I could find no evidence of these tours running today. Practical information. 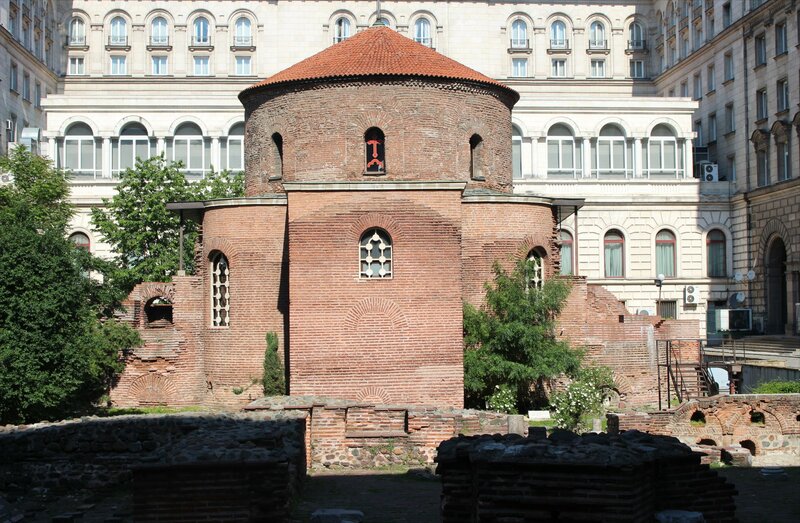 The area offers much to the tourist, with sights such as the Rotunda of Sveti George and the Archaeological Museum located just off the Largo and the new attraction of Roman Serdica under the square (illuminated by a glass roof). 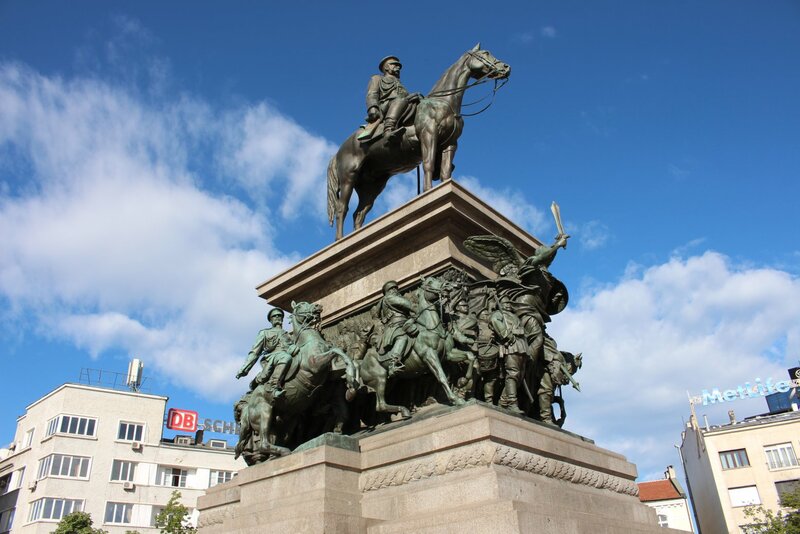 If you are staying out of the city centre it is easy to reach all of this by taking a metro to Serdica or one of the trams that stop in the neighbouring streets, otherwise it’s a short walk from most central hotels. 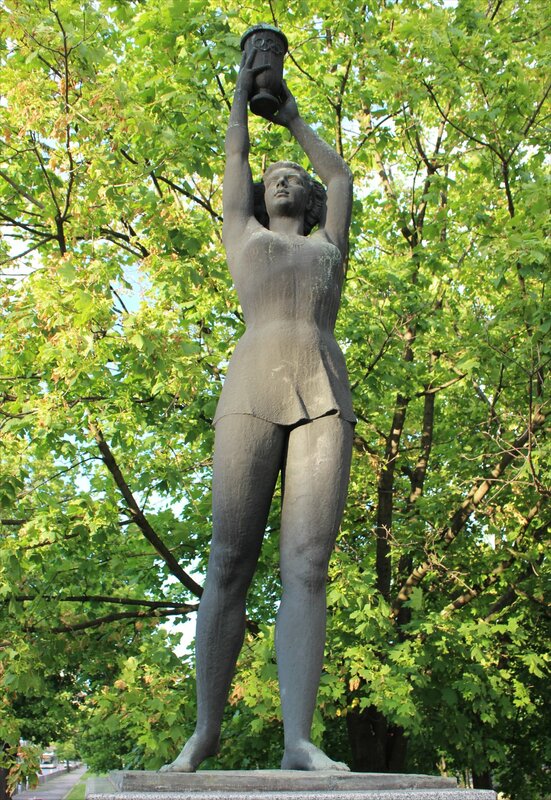 The star that used to sit atop the party house and the statue of Lenin can now be found in the grounds of the Museum of Socialist Art. There is an interesting story to the star (or rather stars) at The red star revisited as well as some fascinating pictures of the Largo under construction in the 1950s. 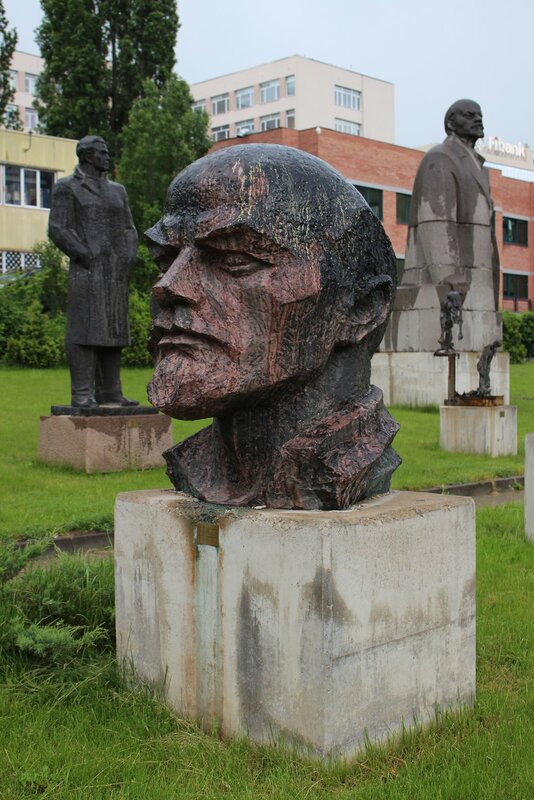 The big monuments and buildings from the communist era may still remain for now, but traces of this are much less evident away from the centre. 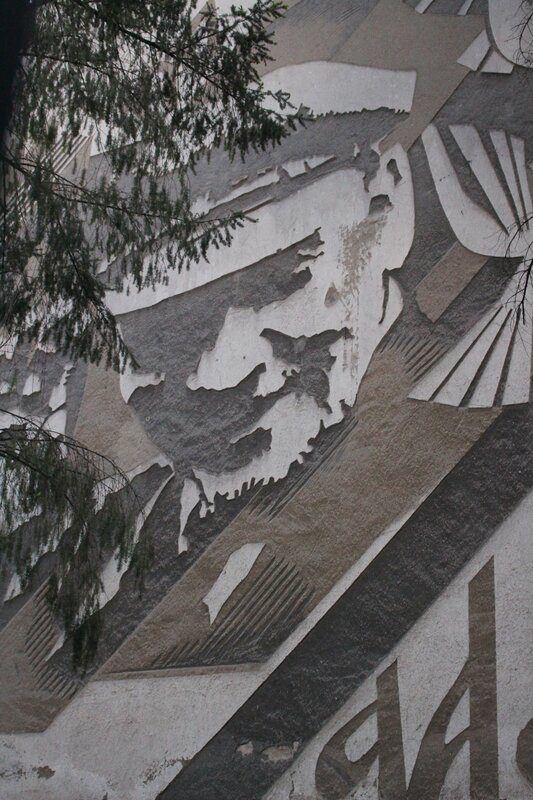 One survivor is a piece of wall art on the Russian Lyceum in boulevard Sveti Naum which includes images of Lenin and a Russian cosmonaut. Practical information. 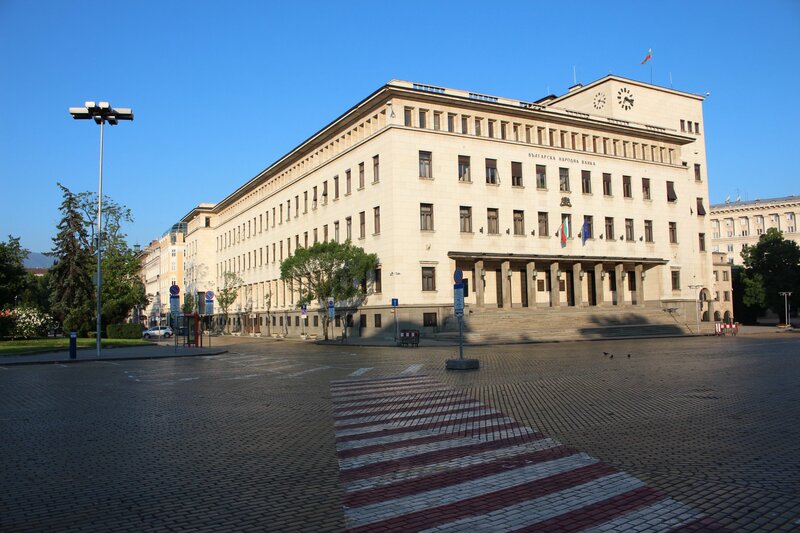 The lyceum is located at 36 Sveti Naum, a short walk from European Union Metro Station. 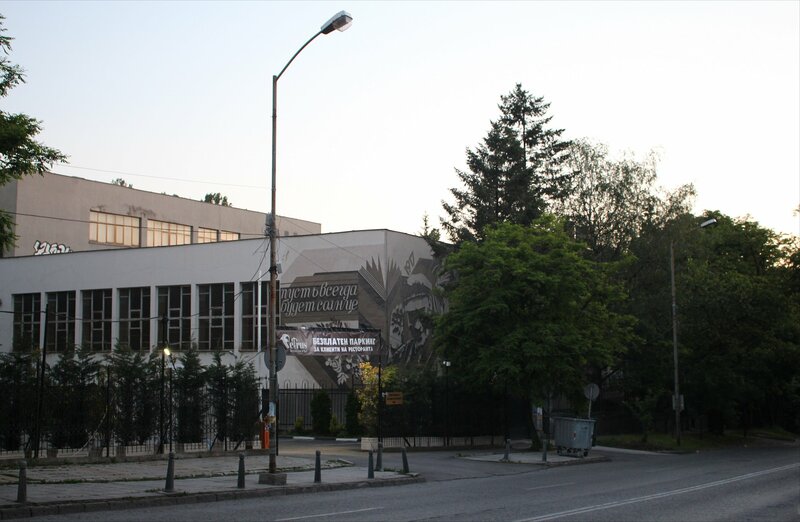 The school building is on the right hand side of the street with the wall art located at the end of the building furthest away from the metro station. 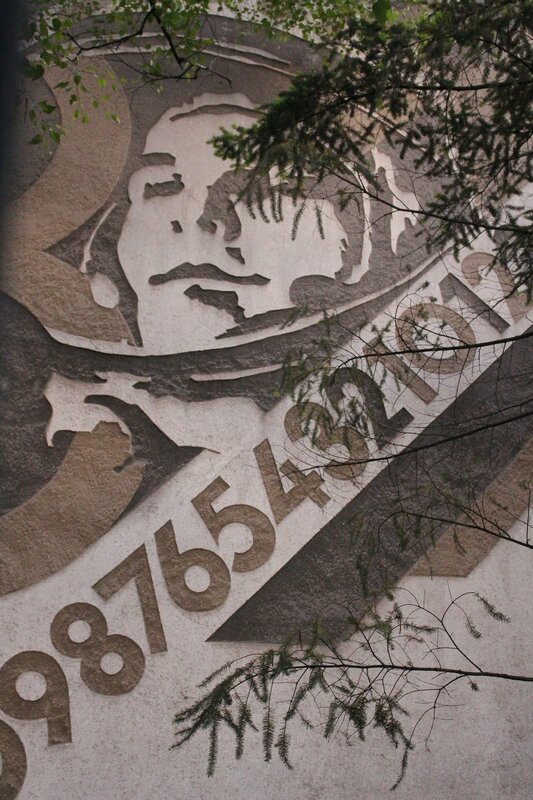 The wall art is pretty well screened by trees so you may find it easier to view from the opposite side of the road. I didn’t spot the images immediately, but the date ‘1917’ told me I was looking at the right spot. 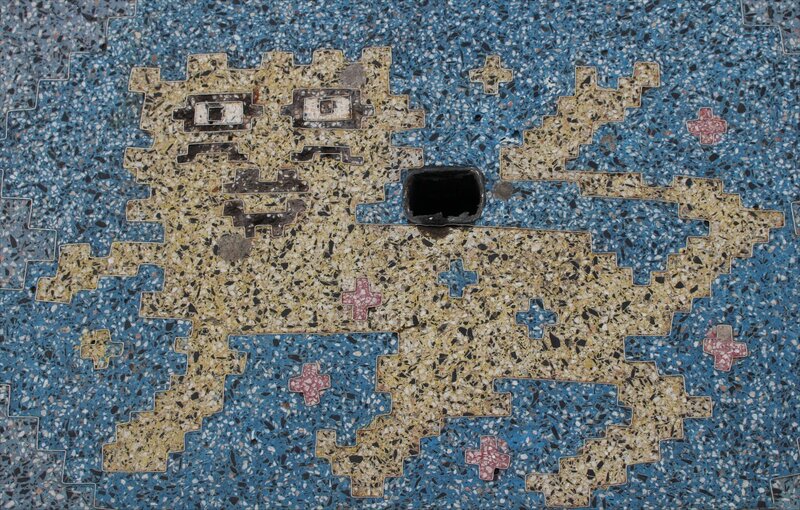 It is worth being a little cautious as you navigate Sveti Naum as the pavement is in particularly poor condition in places with dodgy manhole covers, broken and uneven paving slabs. It is also a fast and busy road so a degree of care is required when crossing the street (signage offers a reminder that there are crossings here, but drivers seem more than a little surprised by anyone daring to use them!). 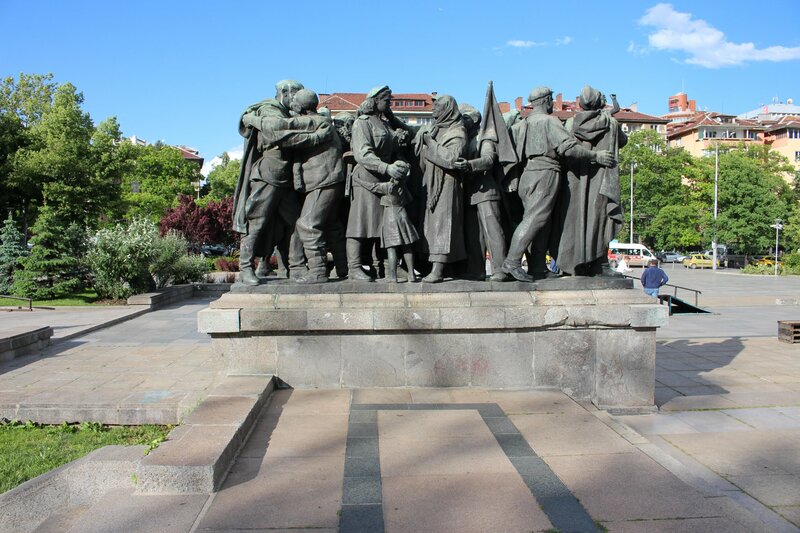 Credit must go to Sofia: in your pocket for pointing me towards this sight, which I hadn’t seen mentioned anywhere else. I’ve been using the in your pocket series of guides for 12 years now and they are unrivalled in the Eastern bloc. 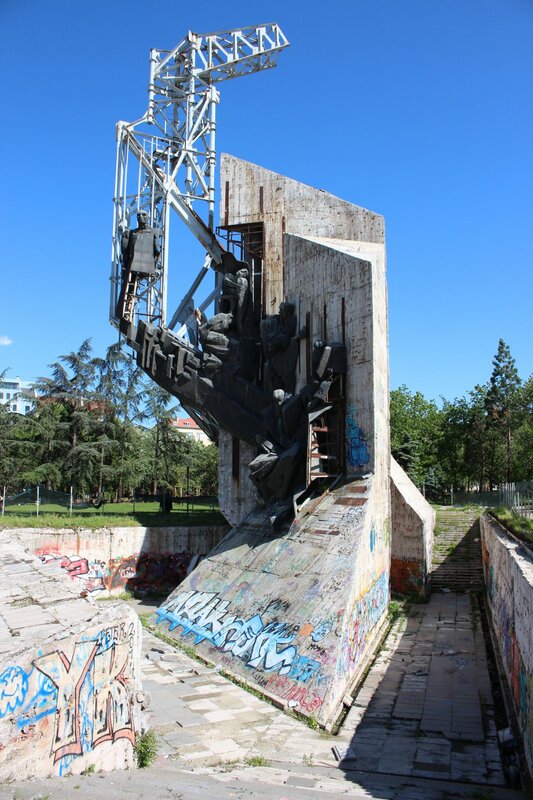 Friendship Bridge (Most na druzhbata) is another piece of political propaganda that became part of the daily fabric of life in Sofia in 1953, subtly pressing its message about the brotherhood between Bulgarians and the Soviet Union. 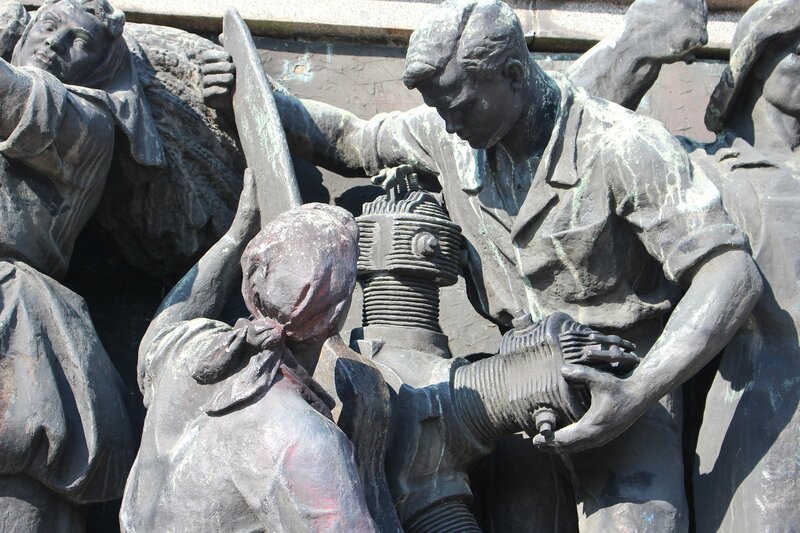 Sculptural compositions stand at all four corners of the bridge representing the workers, intelligentsia and the army. 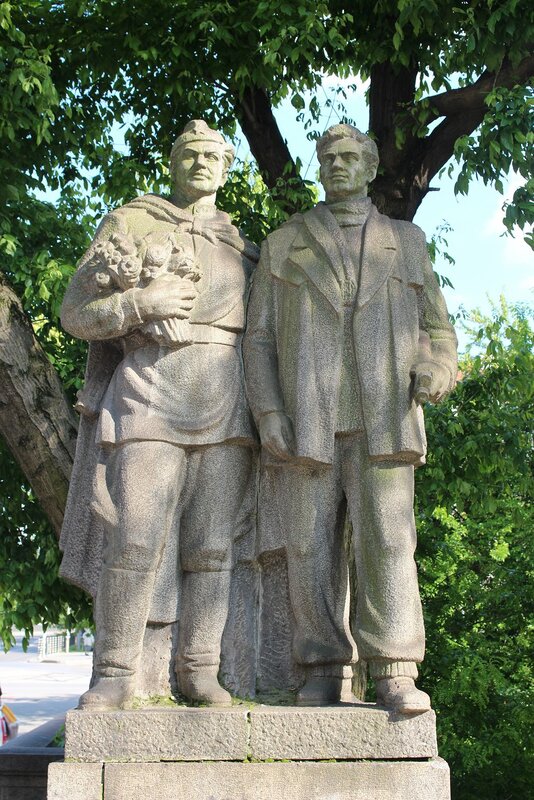 It looked perfectly innocent to my Western eyes, but the Russian soldier standing side by side with his Bulgarian equivalent is yet another attempt to draw a parallel between the liberation of the country after the Russo-Turkish War of 1877-78 and by Russian forces in 1944-45. The bridge stands at the crossroads between ulica Graf Ignatiev and bulevard Evlogi i Hristo Georgiev, looking down over the rather murky waters of the Perlovska. 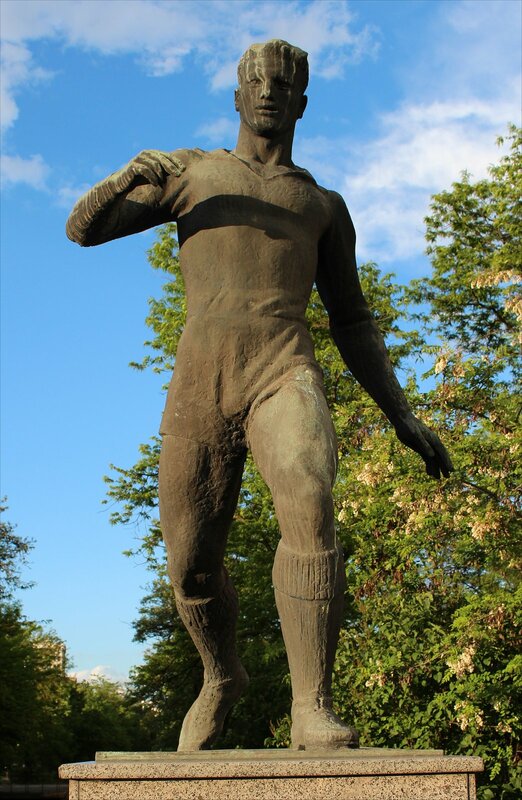 It’s easily accessed on foot from the city centre, or by public transport by taking the metro to the station for the Vasil Levski Stadium. 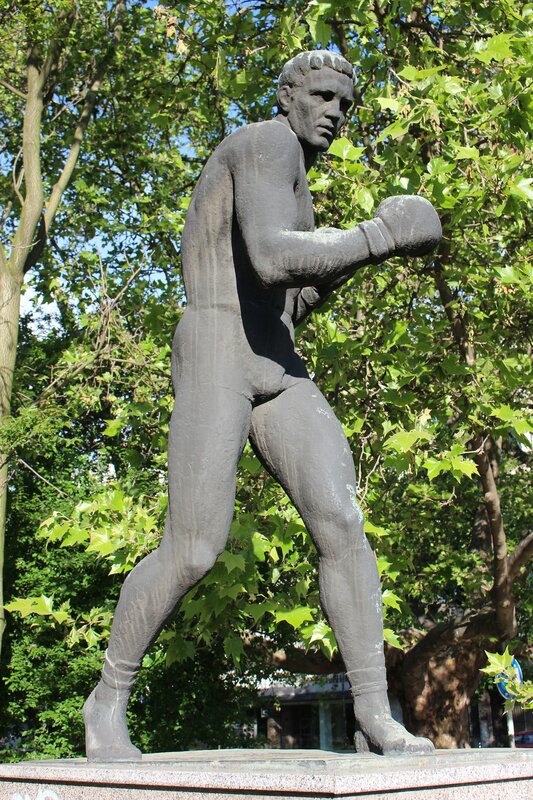 The sporting hero has long proven to be a useful tool for communist and fascist states alike, immortalising their idealised citizens in stone and bronze. 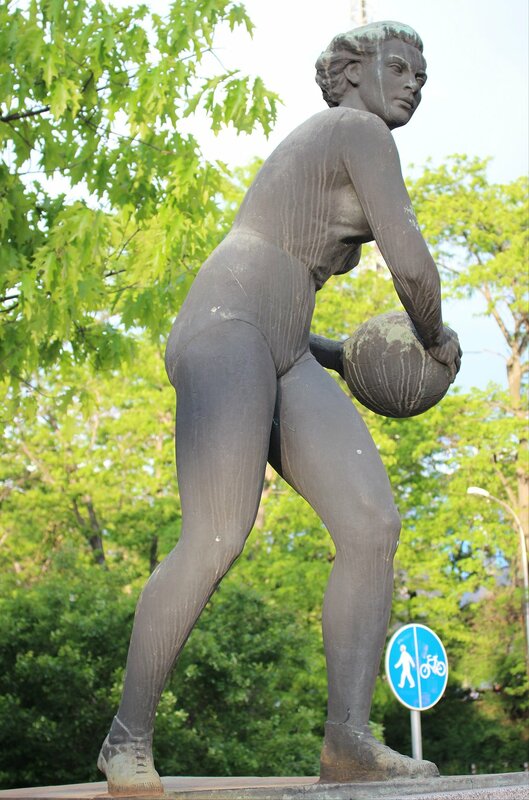 Sofia has its own collection of sporting statues to discover, though like many of the monuments from this era they are in poor shape and a frequent target for grafitti artists. 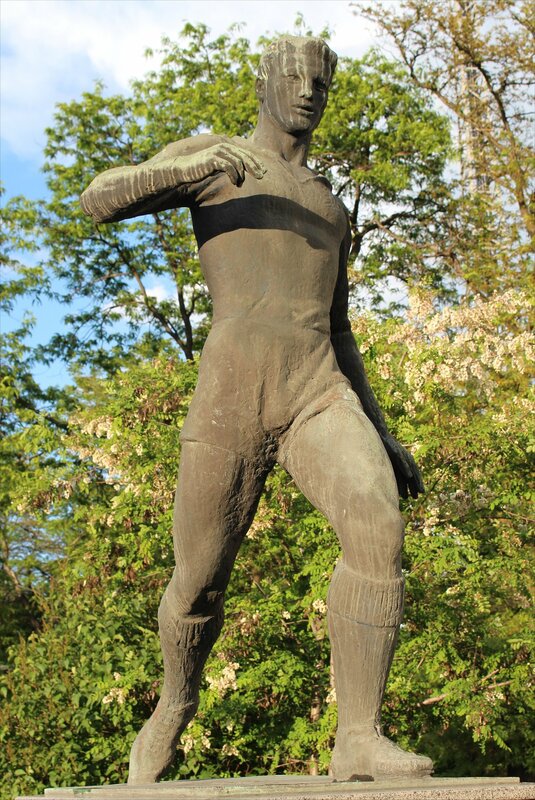 The approach to the main entrance to the Vasil Levski Stadium is lined on either side with sporting statues produced by a team of artists, such as Dimitar Daskalov, in the 1950s. 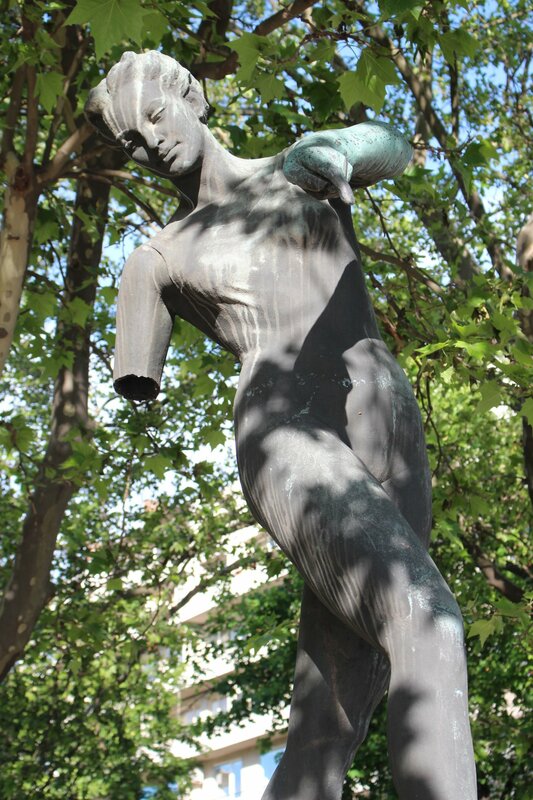 Seven of the plinths are filled, giving us a football player, an athlete holding an olympic trophy, a netball player, an olympic torch bearer, a boxer, a relay runner and a woman whose sporting talents are now lost along with her arms. 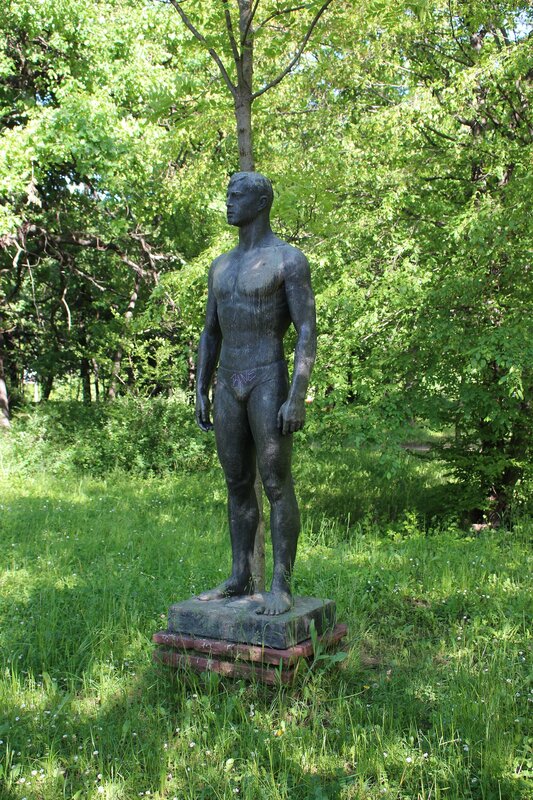 The eighth plinth is empty, but I stumbled across a statue of a swimmer in the south eastern corner of Borisova gradina that looks like it might be the missing figure (located close to the intersection of aleya Yavorov and bul. Peyo K. Lavorov). Even if it is not, it was still an interesting discovery that I wouldn’t have seen if I hadn’t got completely lost in the extensive grounds of the park! 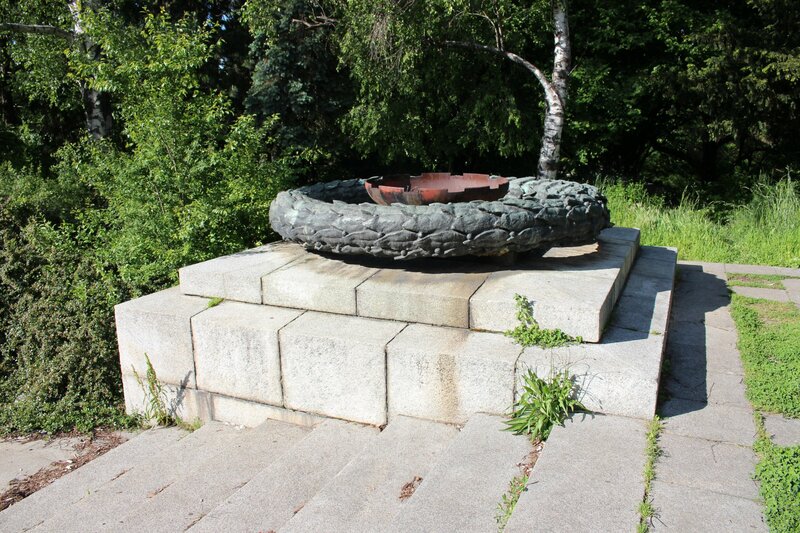 The Mound of Brotherhood (Bratska mogila) in Borisova Gradina (formerly Freedom Park) is a memorial complex constructed as a permanent reminder of the sacrifice of the partisans to free Bulgaria during the Second World War. 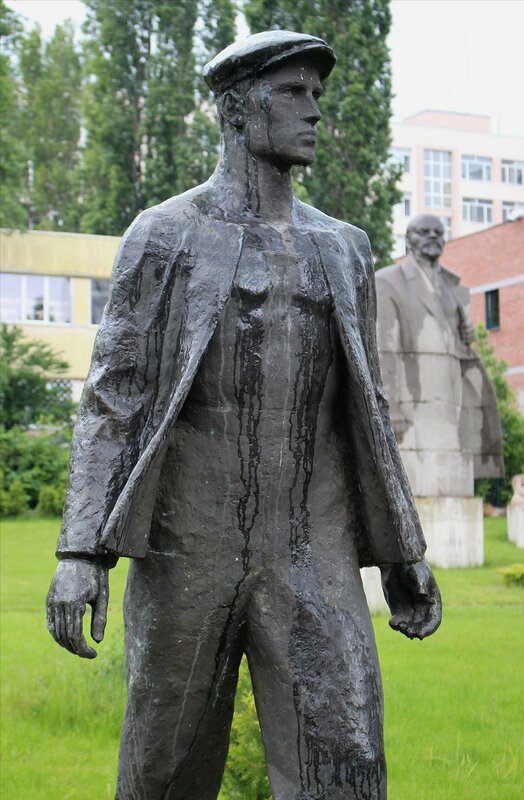 It was opened on 2nd June 1956 – the 80th anniversary of the death of Bulgarian revolutionary Hristo Botev whose words adorn the monument ‘He who dies in a fight for freedom never dies’. 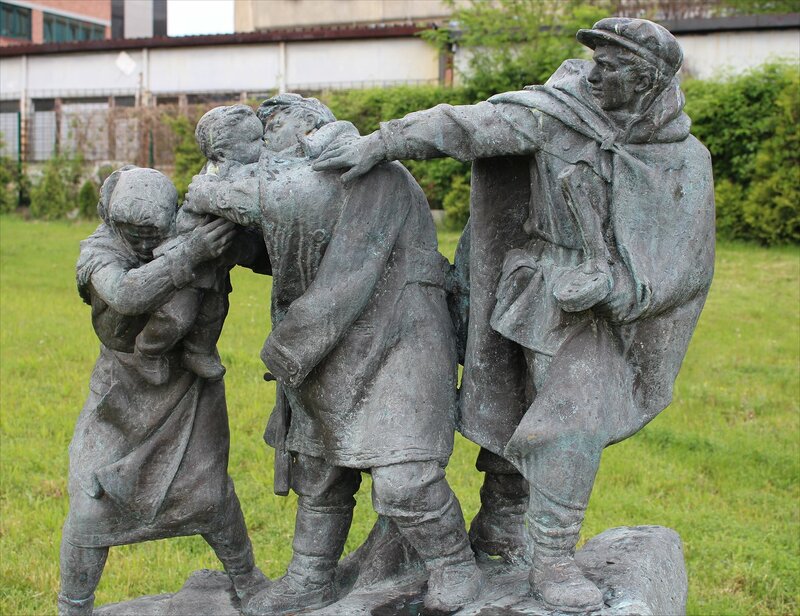 The remains of 17 partisan fighters (members of the Bulgarian Communist Party and the Workers’ Youth Union) who died in the fight against fascism were laid to rest within the site. 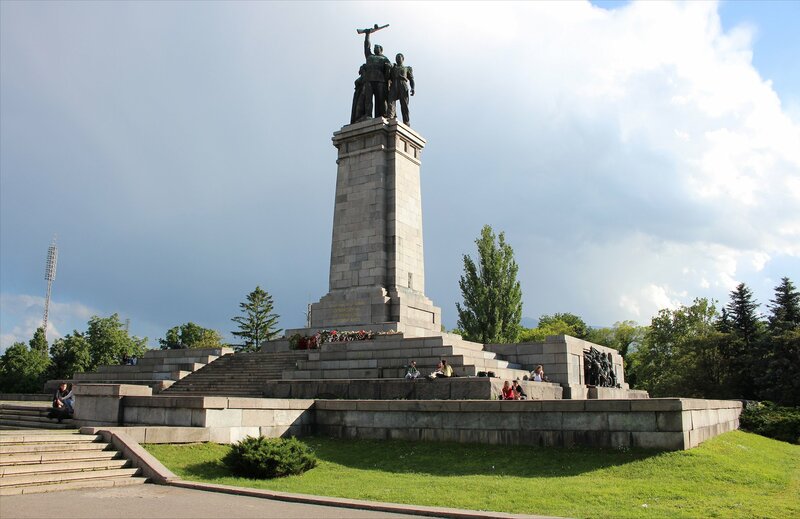 At the centre of the monument are two gigantic bronze sculptures of partisan fighters, weapons in hand, standing at the foot of a 41 metre high granite obelisk. 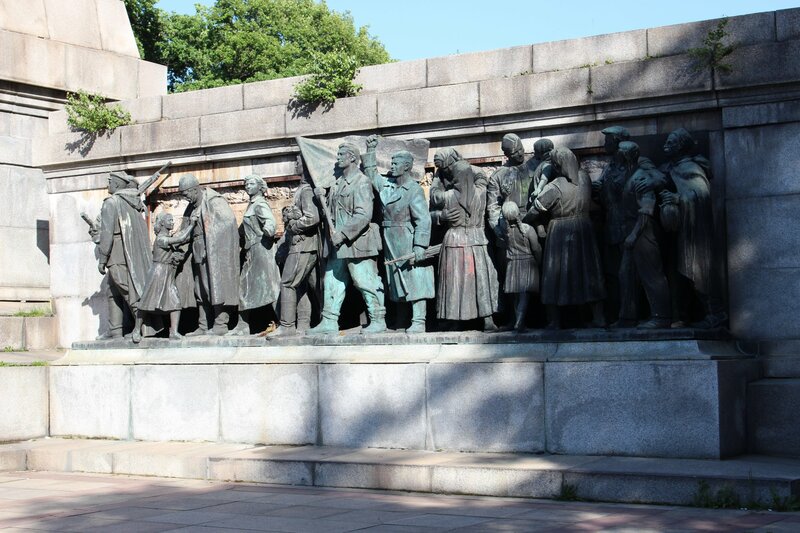 On either side are reliefs that depict the struggle of the Bulgarian people, the welcome given to the Soviet Army and the joy of the people on the occasion of the 9th September 1944 coup d’état. 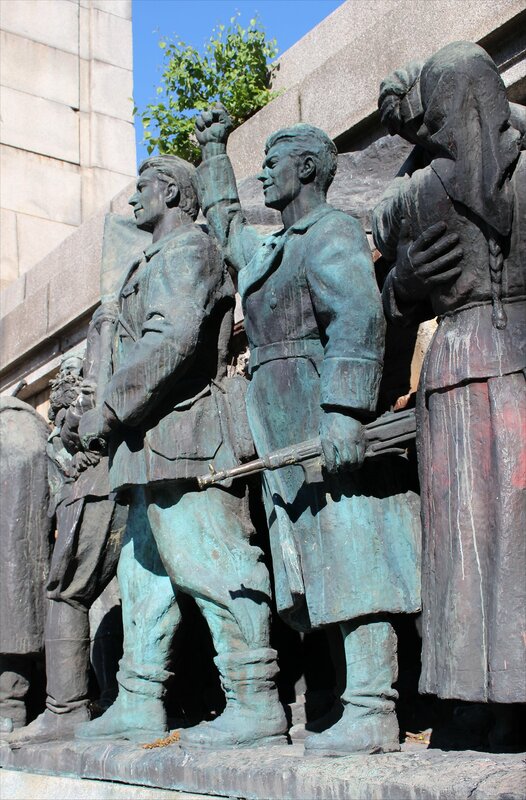 A Balkan Tour description from 1968 highlights the complexity of the story being woven here, bending history to its own ends by linking up the history of the failed uprising of 1923 to the formation of the communist state through the inclusion of the freedom flag in the right relief, now passed to the current generation to carry forward. 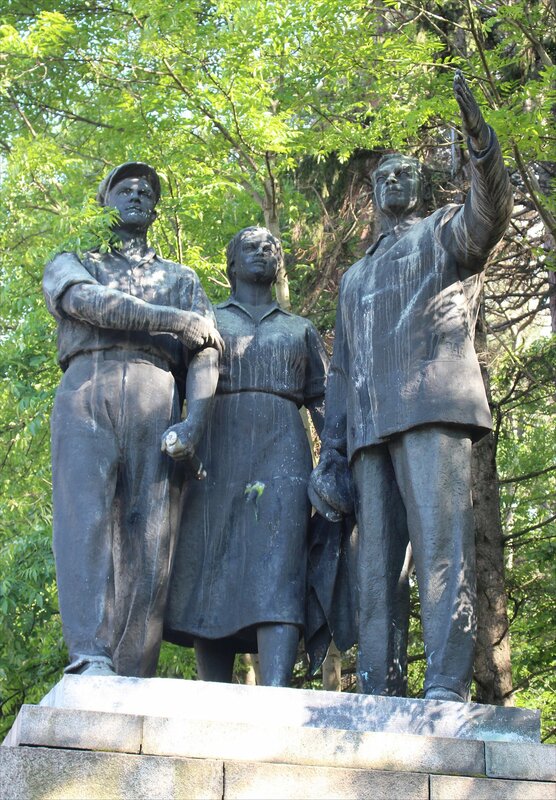 Two standalone sculptural compositions stand on plinths to either side of the central block, one showing us the sacrifice of the common people (a mother seeing off her son to fight with the partisans against fascism) and the other showing us the people building a new socialist future for Bulgaria (a worker, countrywoman and intellectual unified under the leadership of the Communist Party). 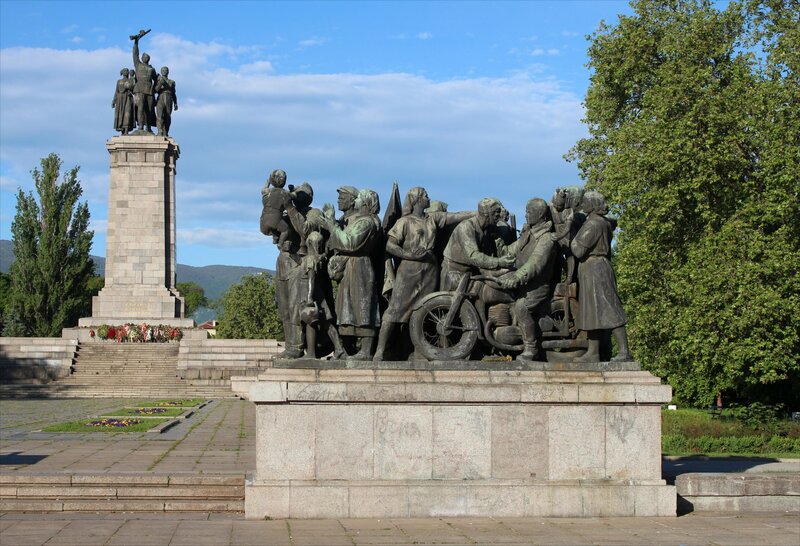 A plan to remove the monument was approved after the end of the communist era, but all they have demolished so far is the two lane processional way with a flower bed in the middle. It’s not quite the same walking up to the monument via a haphazard muddy dirt track! 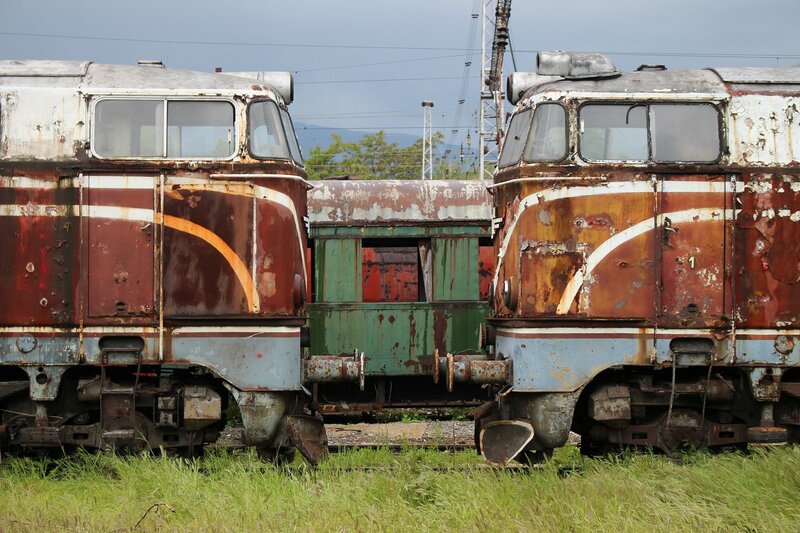 The difference can be seen in a striking before and after photograph on the socbg.com website, showing the difference in the approach between 1965 and 2012. 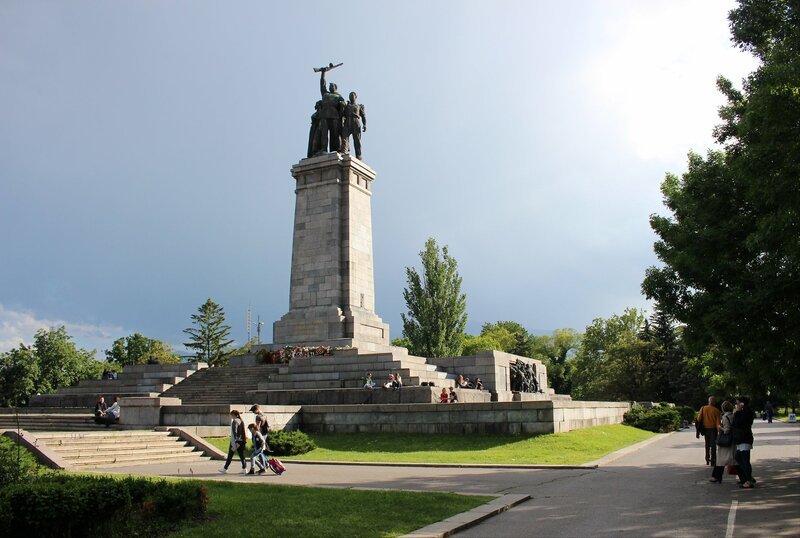 The monument is not in the greatest of shape, with many elements missing from the reliefs on either side of the obelisk. 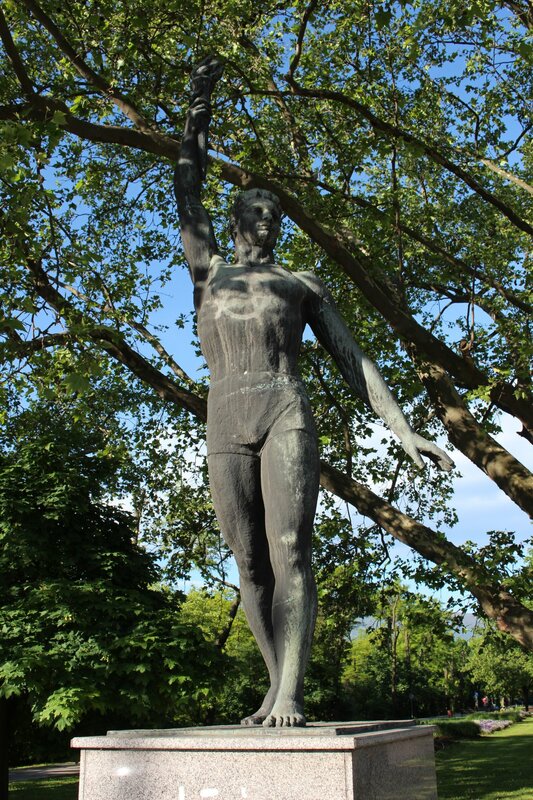 A good many limbs, banners and weapons were missing from the sculpture. In the most extreme case all that remained of one figure, presumably a child, were the feet. 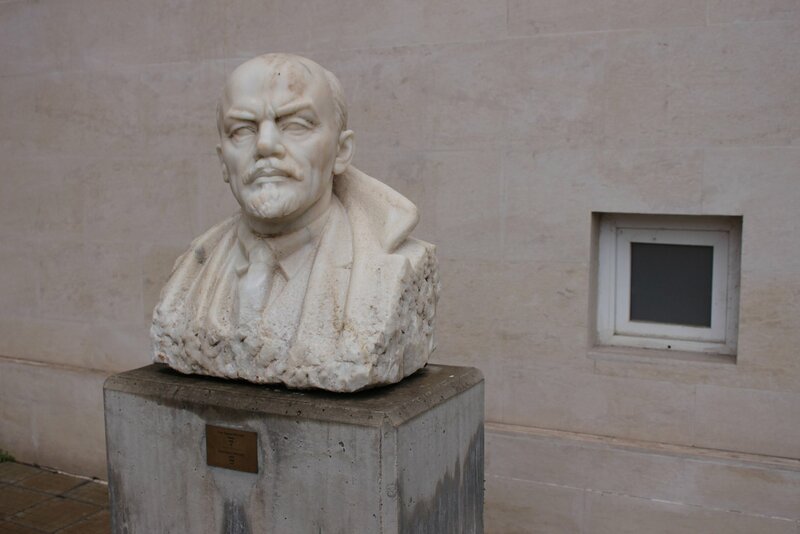 I’m guessing that must have disappeared fairly early on after the fall of communism as the missing figure does not appear in any photographs from the last few years. 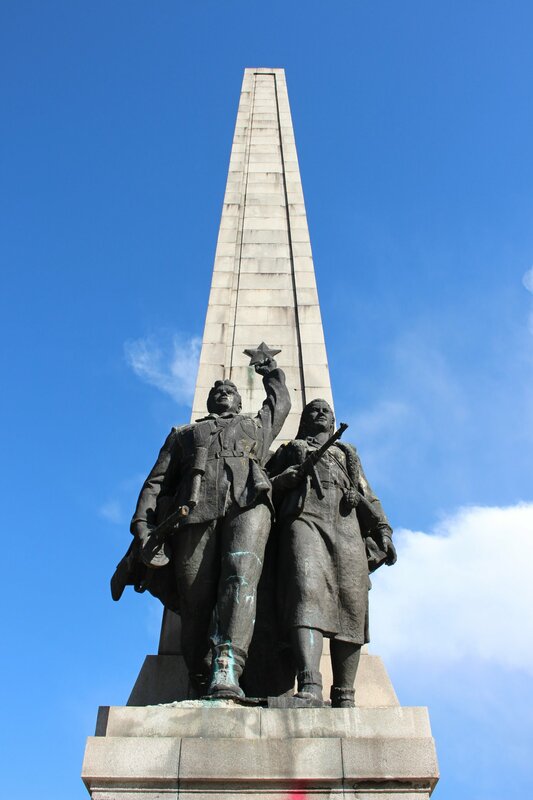 The original bronze plaque was also missing from the front of the obelisk, though it looks as though this has been replaced by engraved text (in common with the Monument to the Soviet Army). 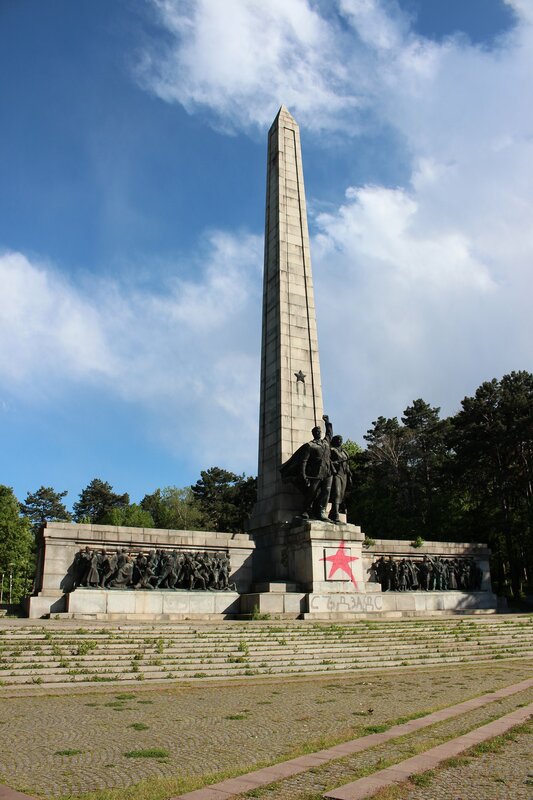 At the time of my visit a red star had been sprayed onto the front of the monument. Practical details. 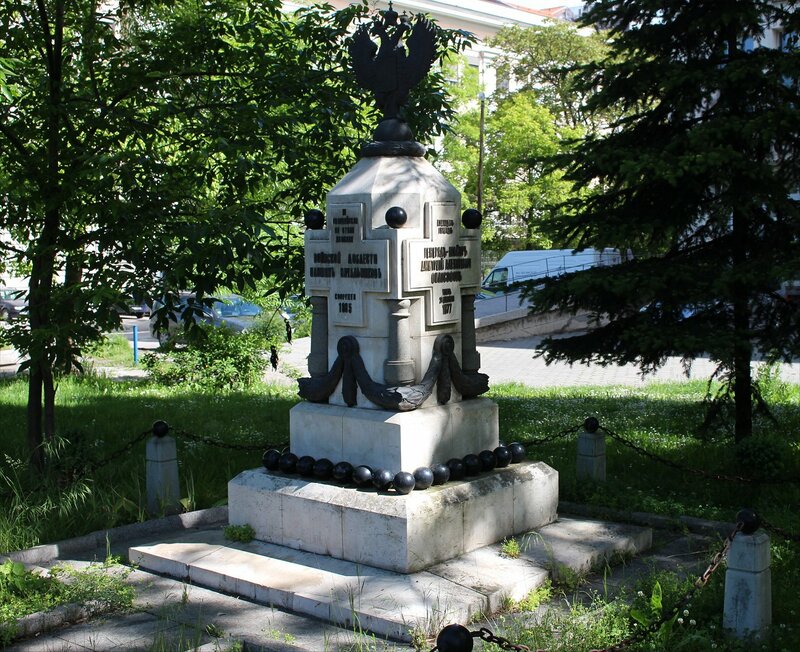 The Mound of Brotherhood is located in the south-eastern corner of Borisova Gradina. It’s an easy walk from either of the nearest metro stations (St. Kliment Ohridski and Stadium Vasil Levski) but I preferred the walk down from St. Kliment Ohridski, crossing the Eagles’ Bridge and then following the pathway through the park that runs parallel to Boulevard Tsarigradsko Shose. It gives you the best impression of the whole complex before you get up close. I visited the monument on a few occasions during the trip, photographing the various elements in differing light conditions. It is perhaps better not visited in the evening as it is a popular spot for gangs of youths to hang out, though they didn’t cause me any trouble. At other times of the day it is a popular spot for walking dogs, exercising and even conducting martial arts classes with swords. It is also worth saying that there is very little shelter around, other than the trees, should you time your walk for a downpour! 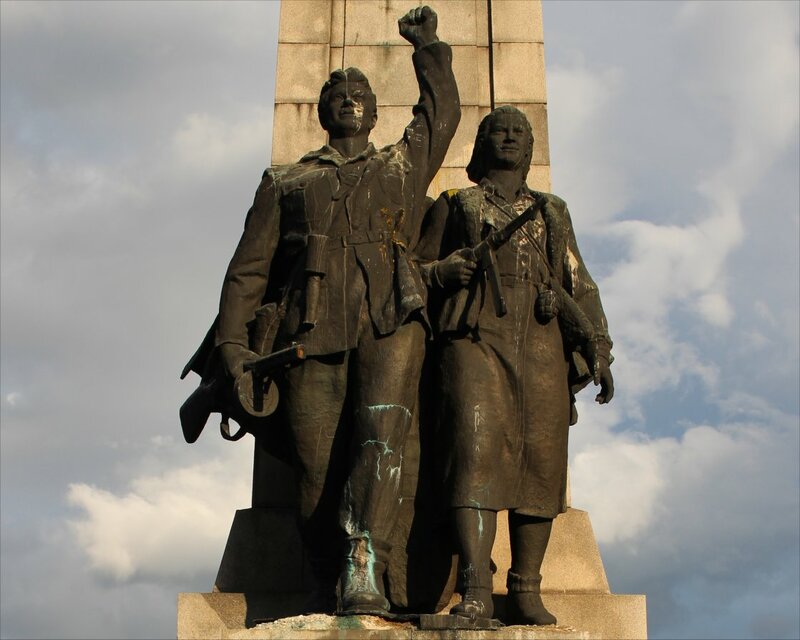 The striking Monument to the Soviet Army stands in the centre of Sofia, presenting the image of a Red Army soldier leading a worker, peasant woman and child towards communist paradise. 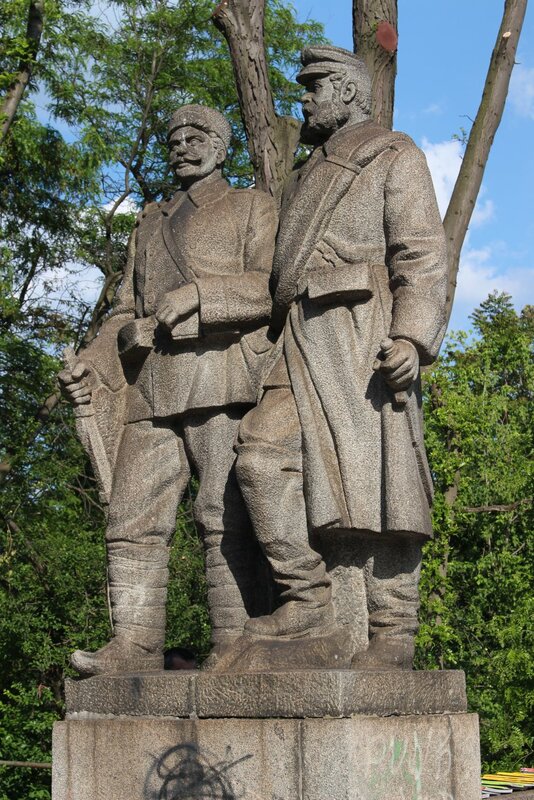 The monument was created by a team of artists and architects under the direction of Danko Mitov in 1954. 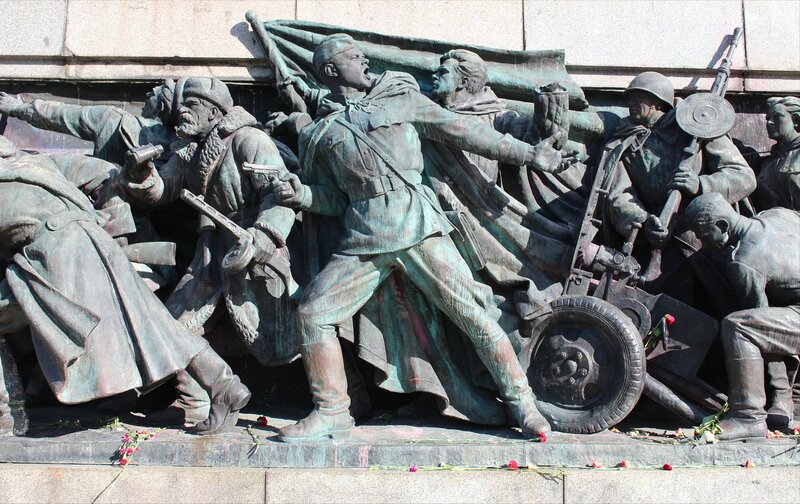 The scale of everything here is immense – the monument takes up a 2000 square metre plot with a grand 80 metre long granite pathway flanked by five bronze wreaths (signifying the victories of the Red Army over Hitler’s forces) laid out before it. The figures watching over everything, from atop the central column, are giants too with the tallest coming in at 8 metres high. 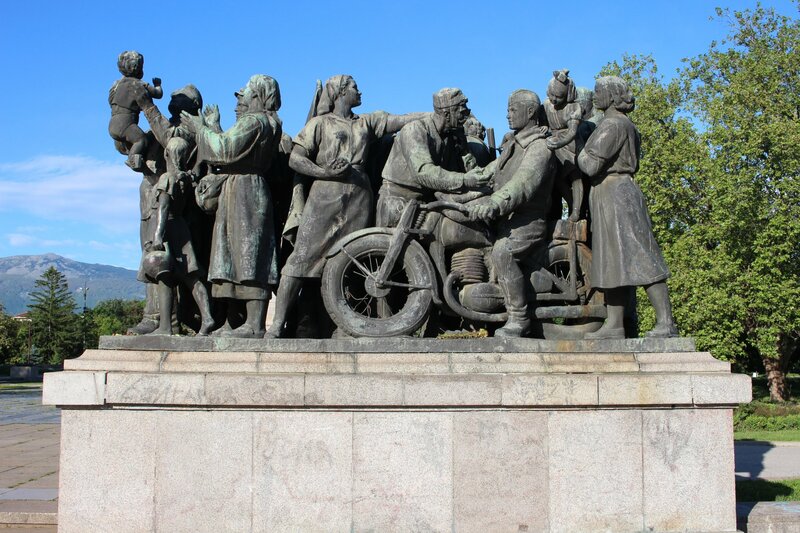 Two standalone compositions at the entrance to the complex show the Bulgarian people greeting Soviet soldiers on foot and motorbike, entitled ‘The Bulgarian people welcomes the Soviet Army of Liberation with bread and salt, flowers and gifts’. 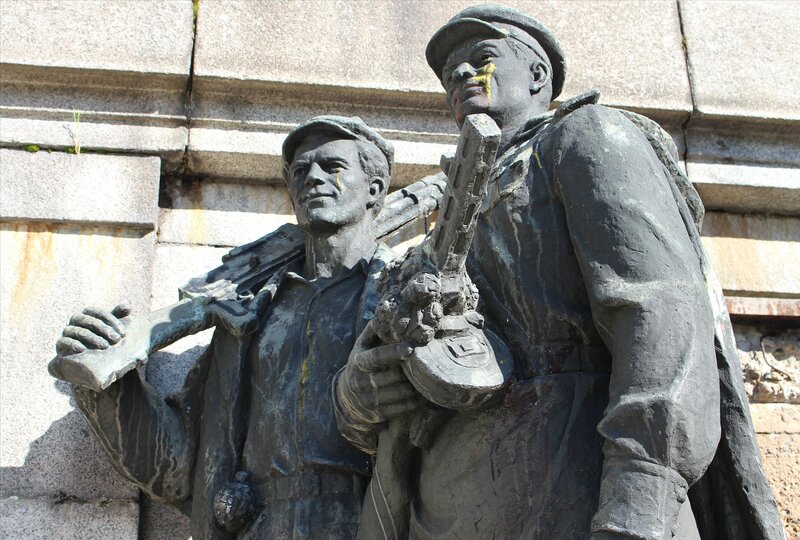 The sculptures were created by a team led by Ivan Funev (1900-83) whose works can also be seen in the National Gallery – Square 500 (look out for ‘The motorman’ and ‘Third class wagon’). 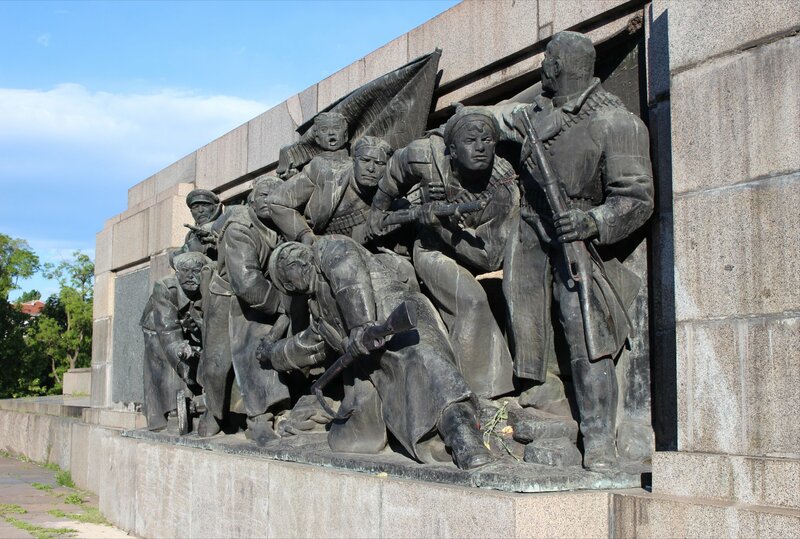 Three panels around the central column depict the October 1917 revolution, the battles of World War II and the support of the people for their army. 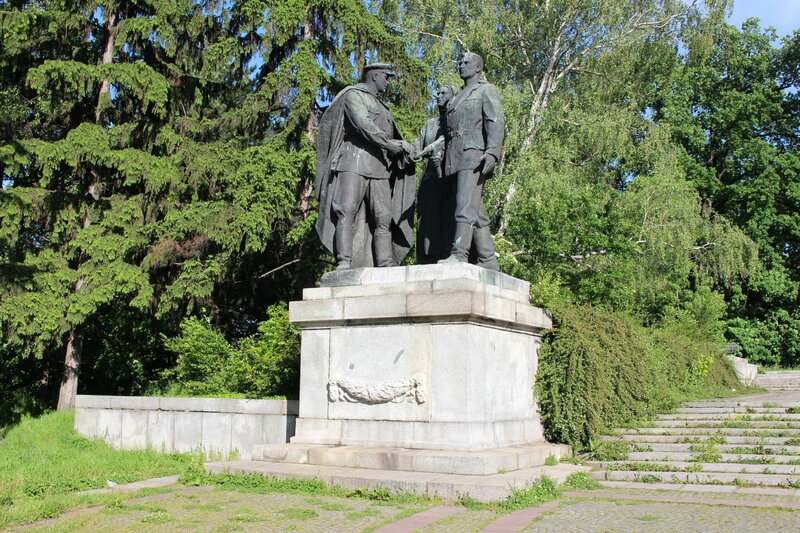 The Sofia Municipal Council voted to destroy the monument in 1993, but no sooner had the decision been made than it became mired in complications. 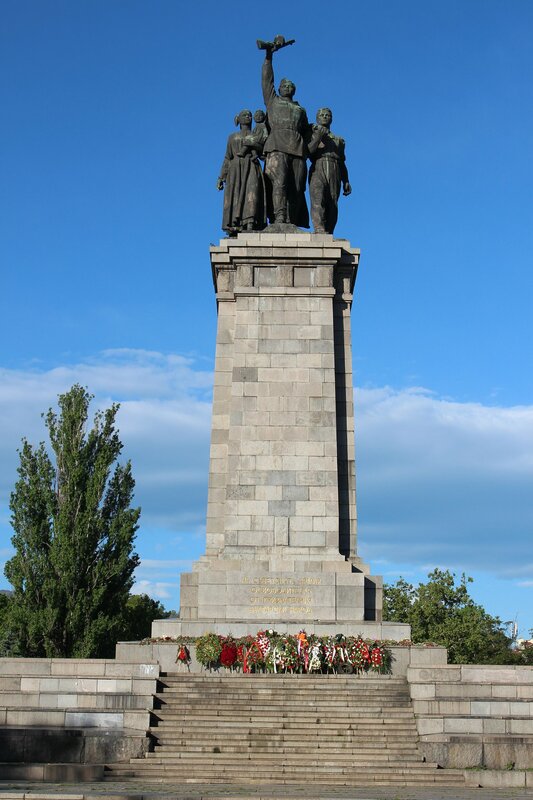 The small matter of the cost of demolition, dogged opposition from the followers of the Bulgarian Socialist Party and questions of legality (specifically, on whether the momument was protected under a treaty of friendship with Russia) all contributed to the shelving of the plan in the short term. 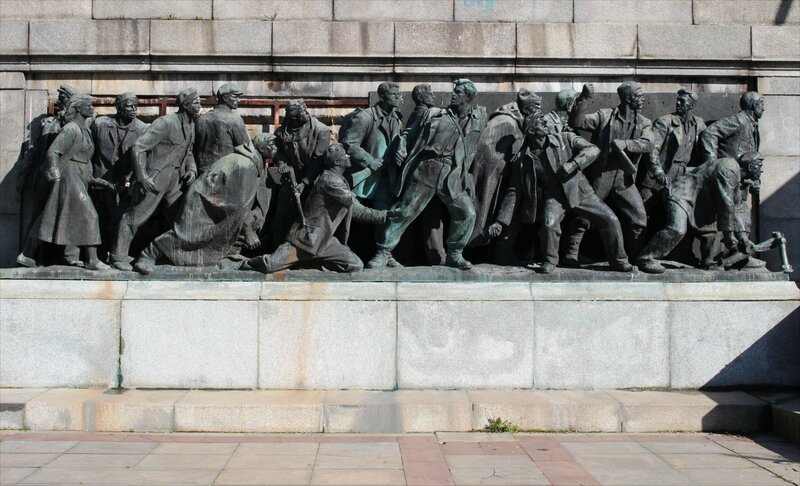 Since then the space around the monument has become a popular spot for skateboarding, whilst the bronze bas reliefs have become a focus for political protest. 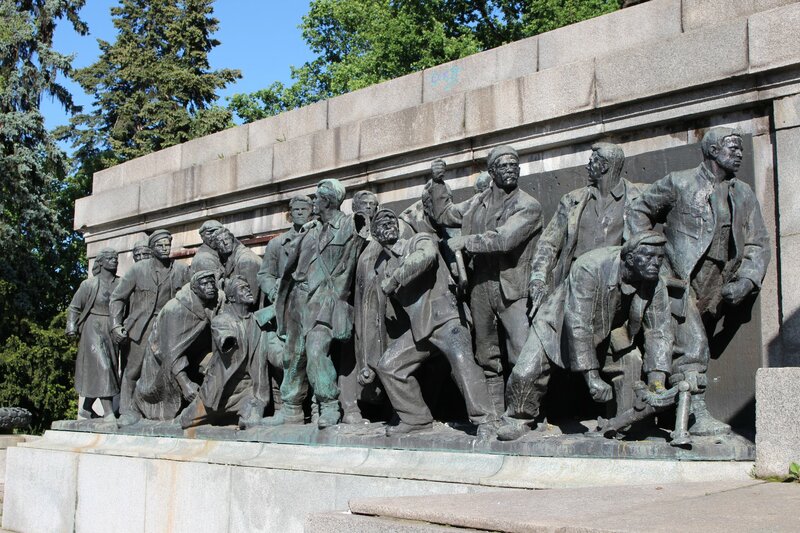 The reliefs have been various painted by grafitti artists as superheroes, in the colours of Ukraine and in pink to apologise for Prague 1968. 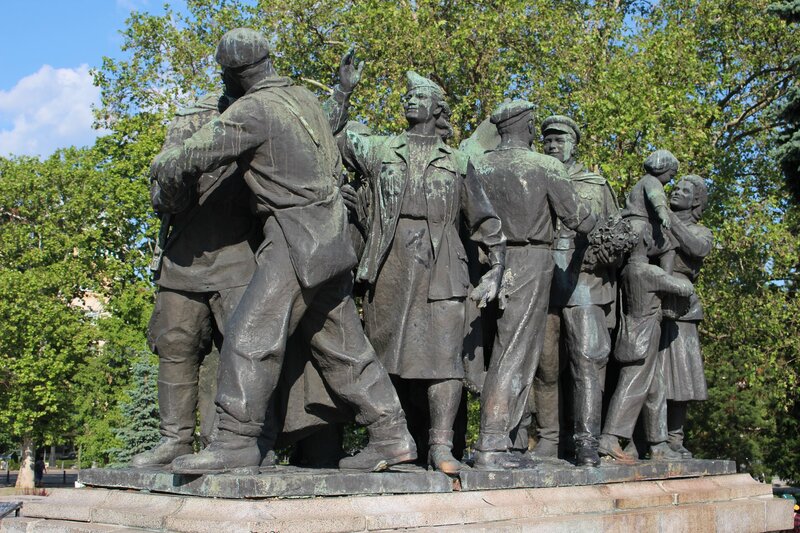 We could see traces of the last batch of paint, but the monument was looking in reasonably good shape after a clean up for the Victory Day commemorations on May 9th. 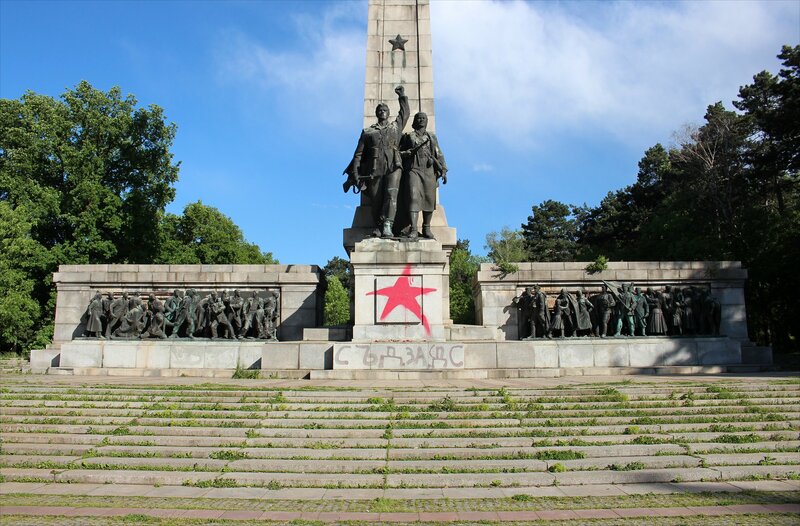 The future of the monument came to the fore again in January 2011 when rallies for and against its removal clashed in Sofia. 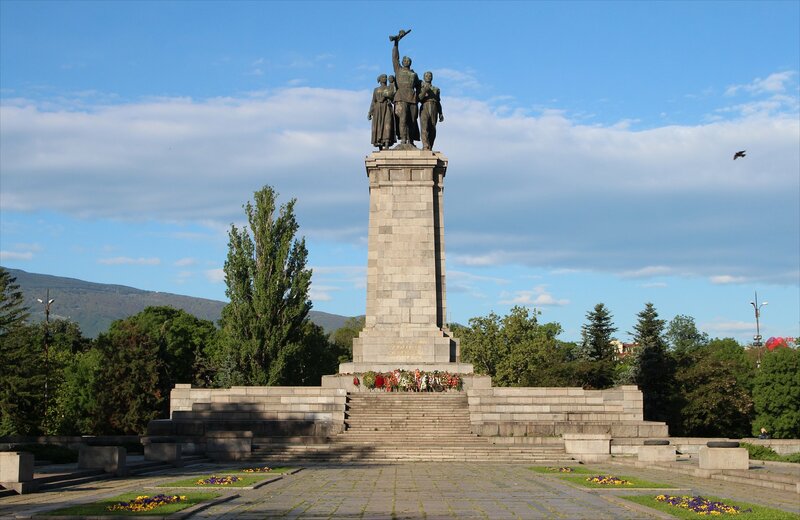 In the great feature article ‘The Soviet Army Monument in Sofia: Keep It but Explain It!‘ Ivan Dikov from the Sofia News Agency Novinite offers some background and sets out the case for and against keeping the monument. 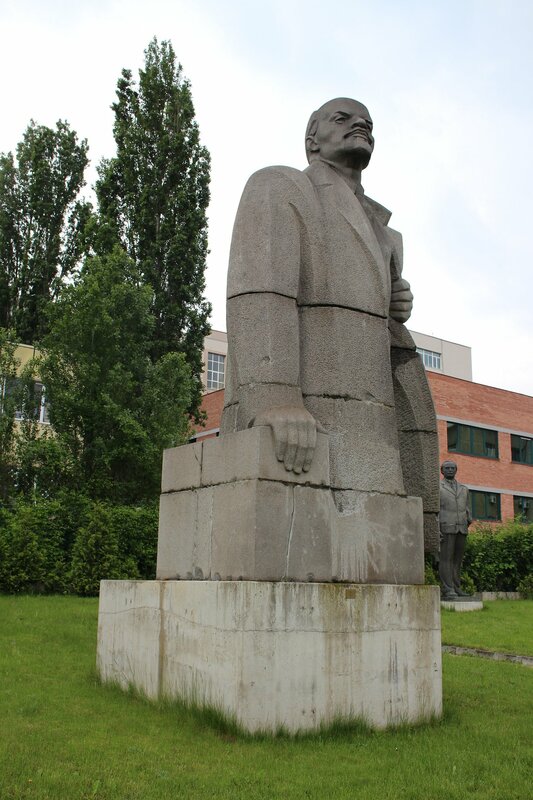 For now the monument stands, but as we have seen in other Eastern bloc states nothing is guaranteed. 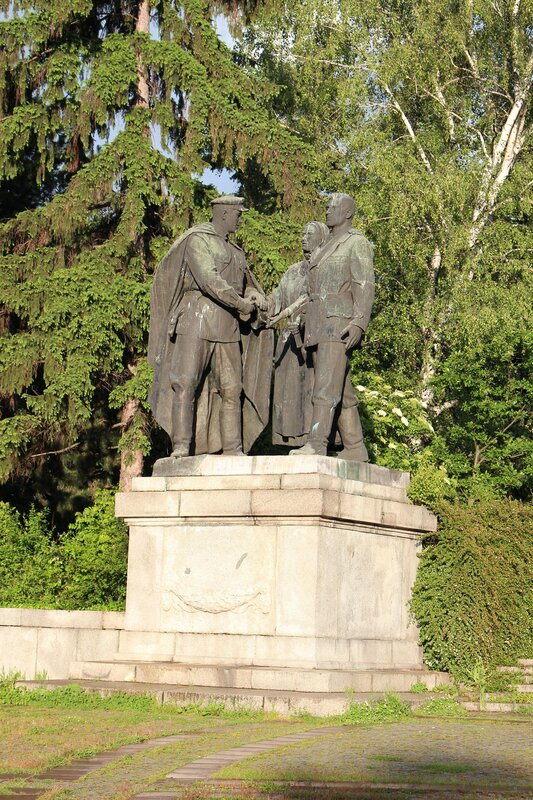 Practical details: The monument is located in Knyazheska Garden, facing out onto Tsar Osvoboditel boulevard, a short wander from the metro station at St. Kliment Ohridski (Sofia University). It is easily visited, though you may need to navigate your way around a few skaters in the process! 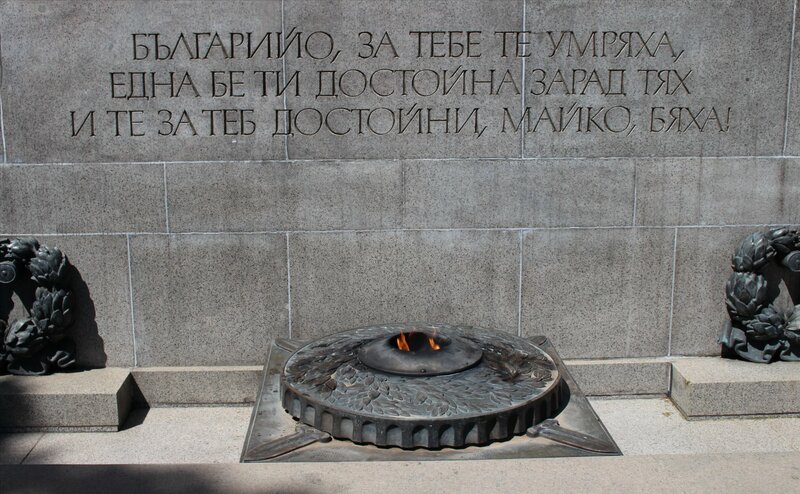 It is worth noting that there is a separate mausoleum dedicated to the Red Army in another location in Sofia. 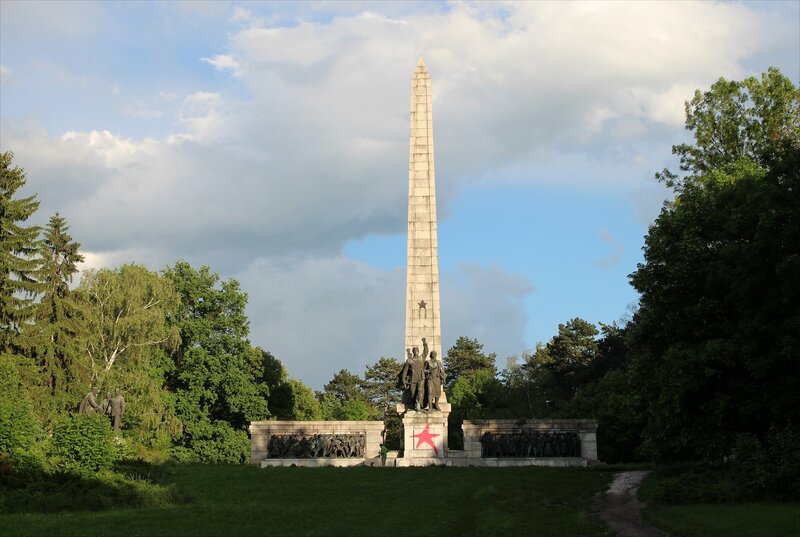 The mausoleum containing the remains of Soviet soldiers who fell during the liberation of Bulgaria can be found at bulevard Cherni vrah 20-24 (see the Traces of War website for further details). 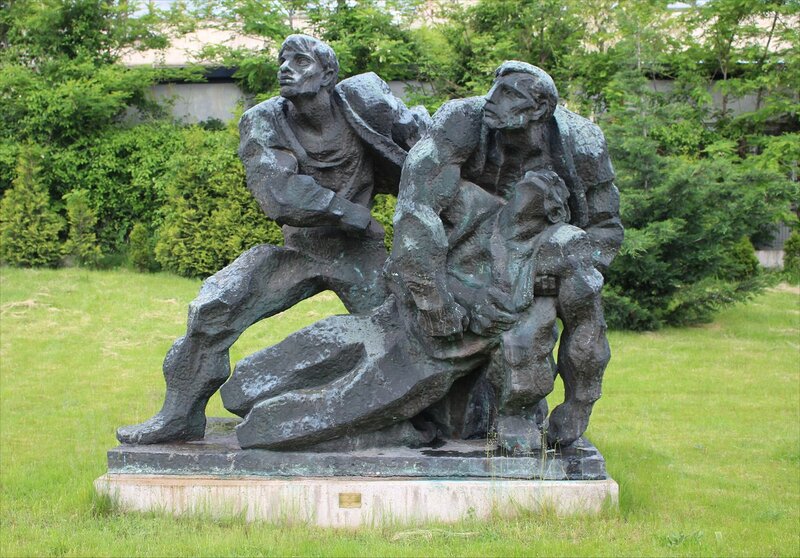 One of the most fascinating aspects of a trip to Eastern Europe for me is the opportunity to see the lingering traces of the artistic output from the era of the tolaritarian state, from paintings following the doctrine of socialist realism to monumental statues that dominate everything that surrounds them. I am always slightly nervous about showing too much interest as I am well aware that these works are loaded with an entirely different meaning for anyone who has lived through those times, whereas for most tourists they are just interesting works of art and objects of historical curiosity. It is rare not to see someone raising an eyebrow as you take a photograph or two and you can feel the question forming – should you really be visiting this place!? 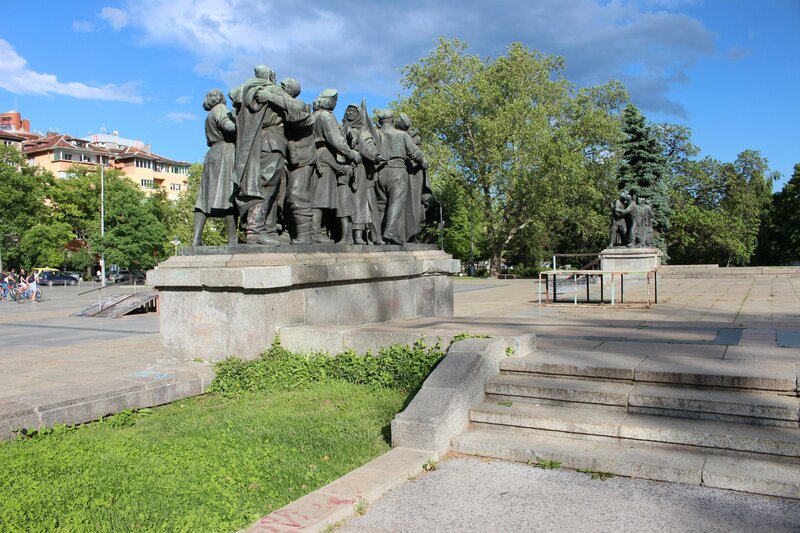 The most significant of these in Sofia is the Monument to the Soviet Army, placed right in the heart of the city and clearly meant to leave the local population in no doubt as to who their saviours were. The continued presence of the monument must chill the hearts of anyone who experienced the terror of the state. 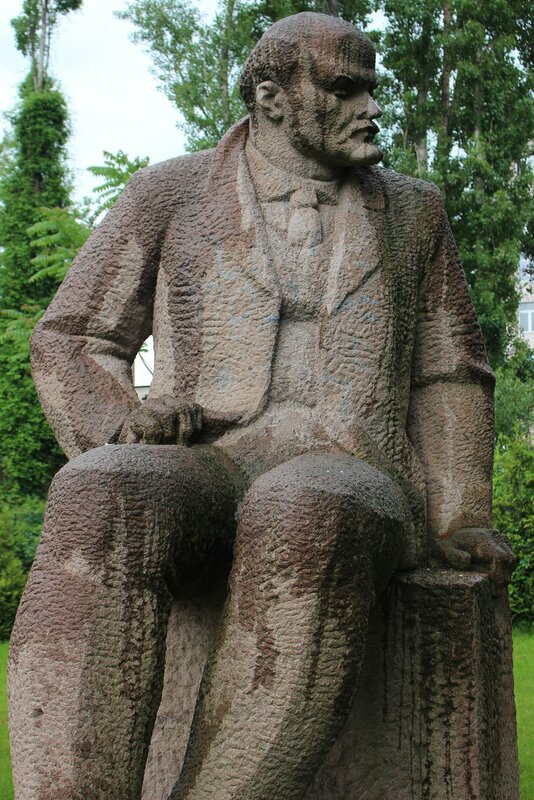 In many other Eastern bloc countries the process of removing these monuments is well on its way, or already finished. 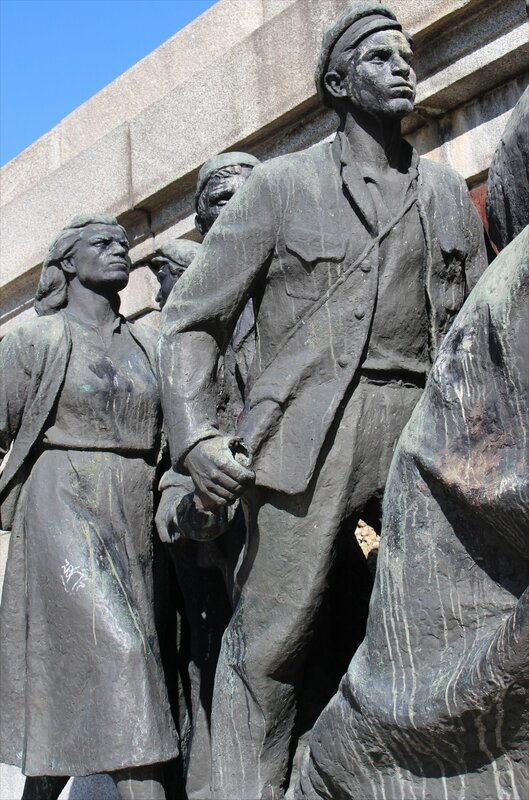 It can’t be an easy choice to make with the danger that erasing these monuments from the present risks taking with it the reminder of what the people overcame to achieve democracy, particularly as the years pass and the struggle becomes ever dimmer in memory. I am reminded of a comment made by W. B. Yeats in relation to the equally contentious statue of Nelson that stood in the heart of Dublin “I think we should accept the whole past of this nation, and not pick and choose.” Mind you, that is probably a bad example given that Irish republicans went on to blow up Nelson’s Pillar in 1966! 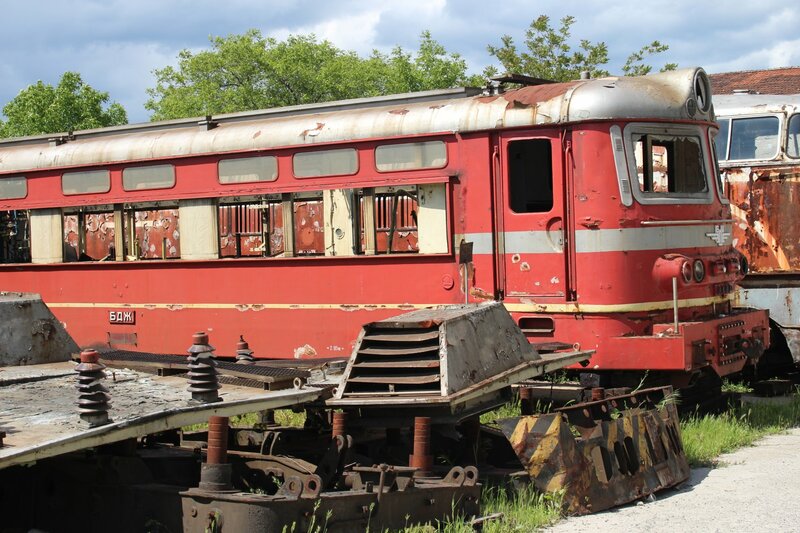 At most of the sites I visited there was an air of neglect, irrelevance and an overriding sense of time taking its toll. 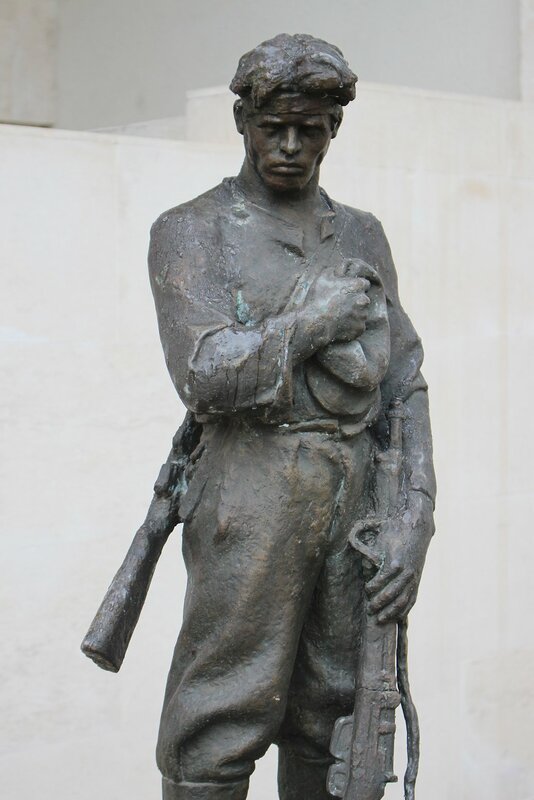 Nowhere did I see any attempt to explain the complex history behind the benign figures immortalised in metal, from the sacrifice of the common soldier through to the forced assimilation of minorities – to me that feels like a missed opportunity. 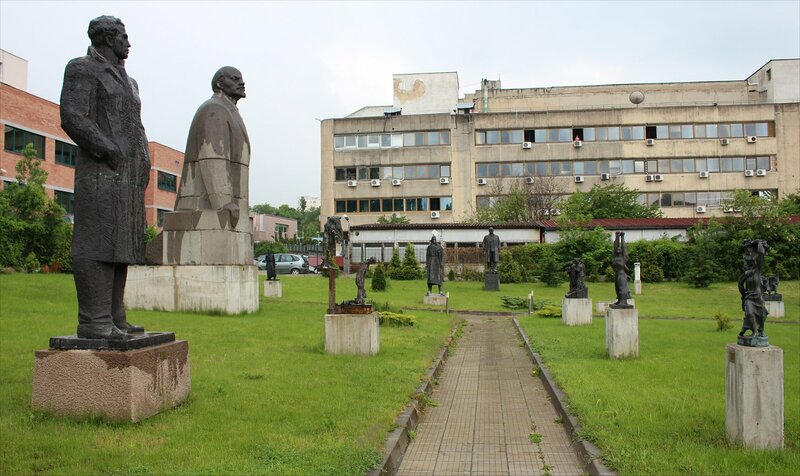 In the next few posts I will highlight some of the remaining sights from Socialist Sofia, all easily reached on foot from the city centre. 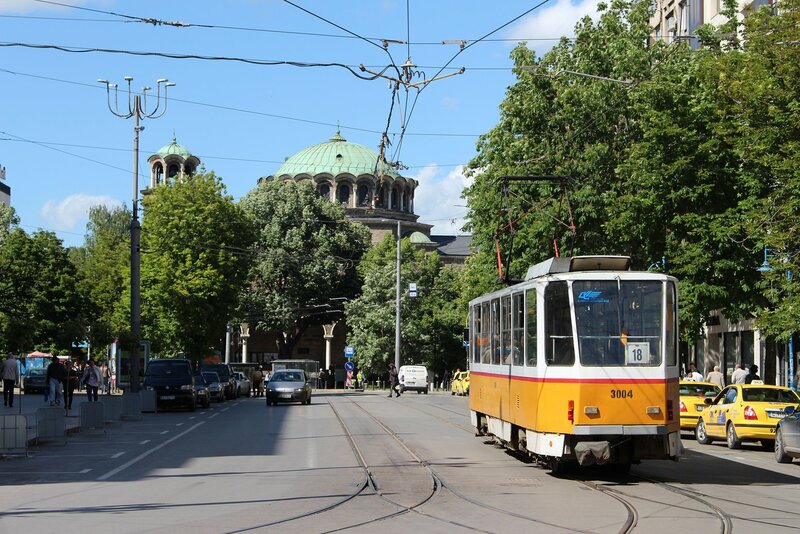 A weekend of sightseeing in Sofia beckons after the excitement of a week playing with trains, but the first priority was to head out to Sofia airport to meet up with Brett who was coming in on the early morning flight from Gatwick. 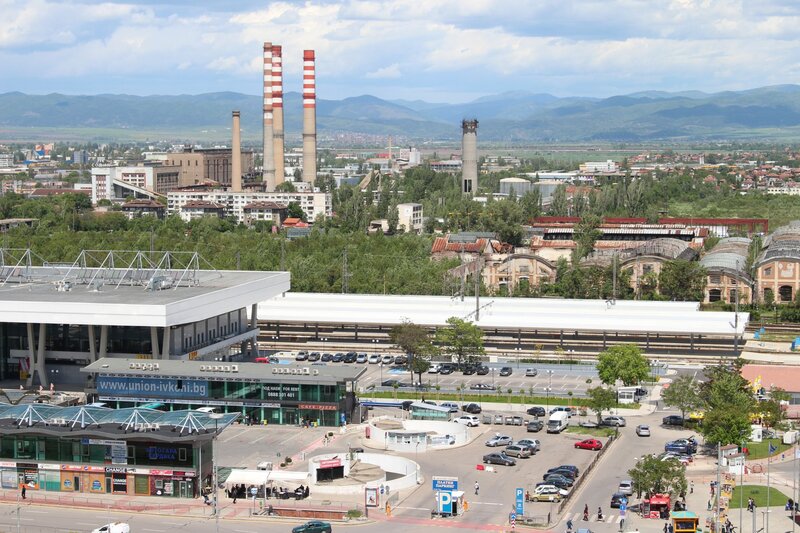 The airport is well connected to the city centre by metro and it only takes around 20 minutes from Sofia University St Kliment Ohridski and only a little longer from Serdika or the Central Railway Station. It’s a smooth journey to the cathedral of steel and glass that is Terminal 2, but getting to Terminal 1 is somewhat trickier! 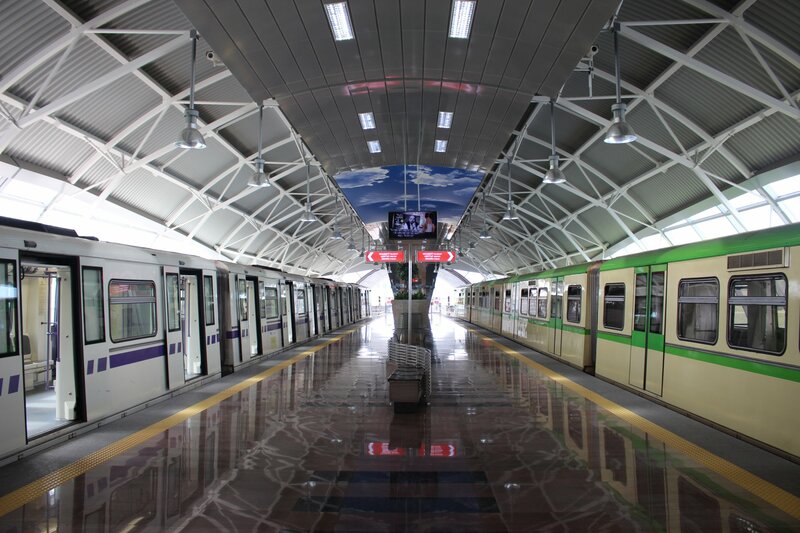 The metro does not connect to Terminal 1 and there is no obvious walking route between the terminals, so the only option is to take the free half-hourly shuttle bus which runs from T2 to T1 departures. It is operated by a mini-bus with just sixteen seats so it was no surprise that it was completely full for the 15 minute run in each direction. Terminal 1 presents a stark contrast to its ten year old sibling, looking fairly unloved inside and out. The terminal was constructed during WW2 and it’s clearly a struggle to squeeze all the check in desks and security systems of a modern airport into the space available. On top of that, some of the public facilities are rather poorly maintained as I discover on a descent to the toilets in the arrivals hall. It’s a rather grim first impression to give visitors. 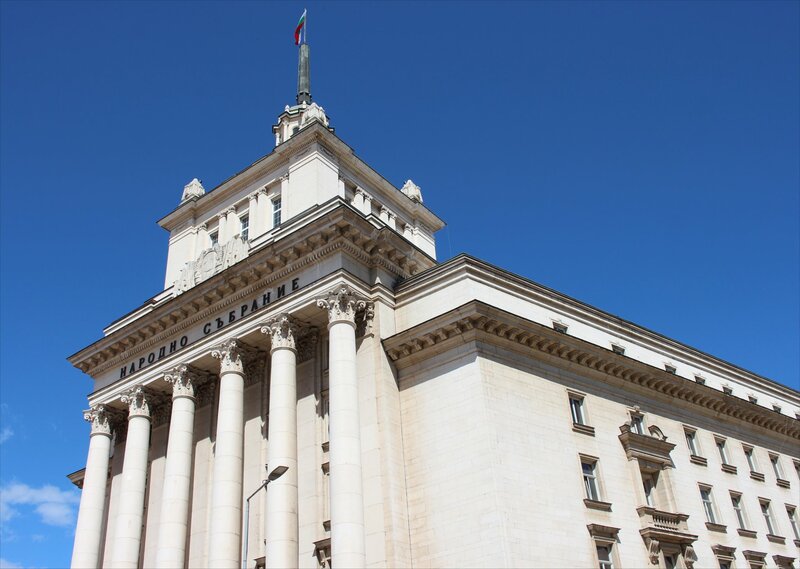 Our hotel for our short stay in Sofia was to be the Radisson Blu Grand Hotel, located right in the heart of Sofia and directly opposite the National Assembly. I was relieved to see that the square was relatively quiet when we emerged from the metro as the previous night it had been the scene of a large demonstration with a heavy police presence! 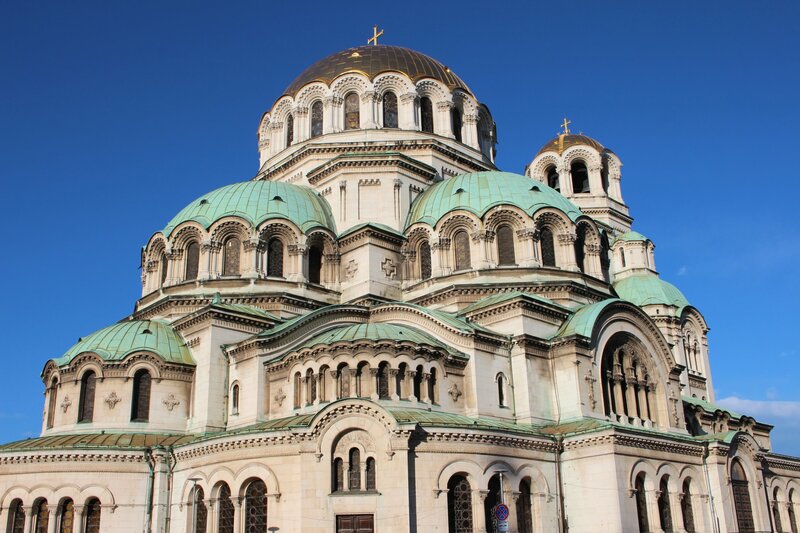 I got a little glimpse of Sofia’s beauty a week earlier, but no time to explore properly. 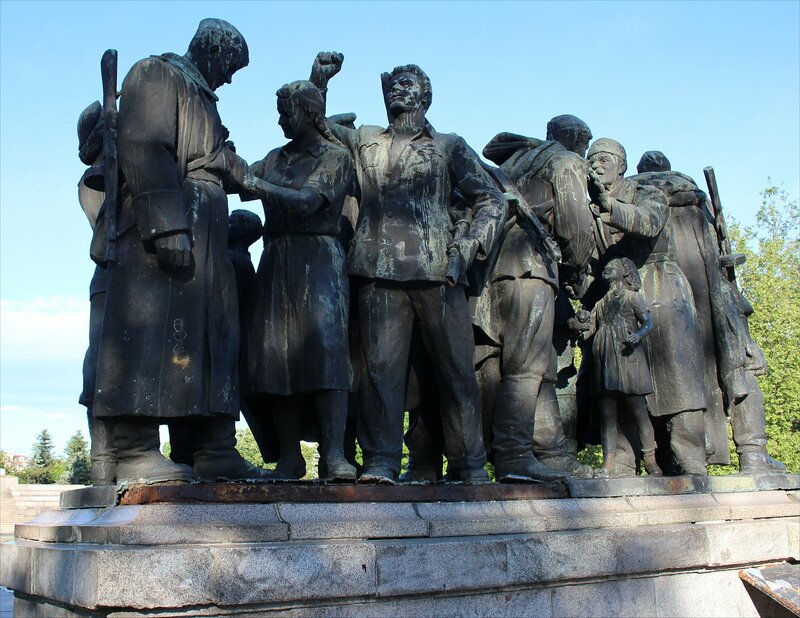 Most of the major attractions in the city are located within a 15 minute walk of the hotel, but the Alexander Nevsky Cathedral and the Monument to the Soviet Army are only a minute or two away so these were top of our list. 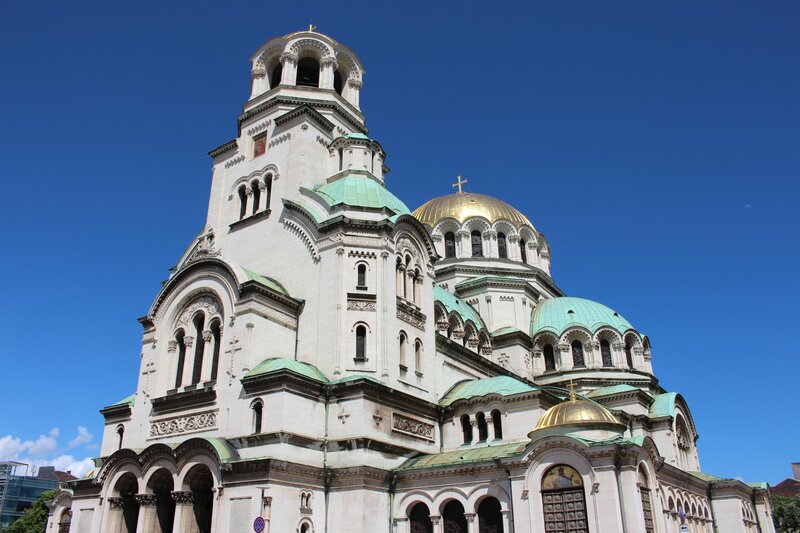 I would hazard a guess and say that the Alexander Nevsky Cathedral has to be the most photographed building in the country and I made no effort to resist the temptation to add to the many millions of photographs that must already have been taken! 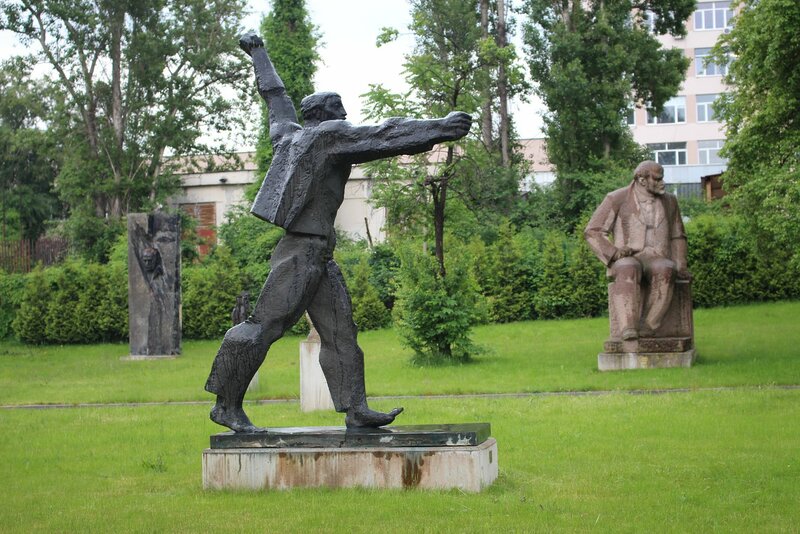 After visiting the most obvious sights near the hotel we set our sights a little further afield and took the metro to the fascinating Museum of Socialist Art, comprising a gallery of socialist paintings and an impressive collection of socialist sculptures in the grounds. The heavens opened whilst we were in the museum so once we had seen everything we headed back to the shelter of the hotel and called it quits on the sightseeing day! 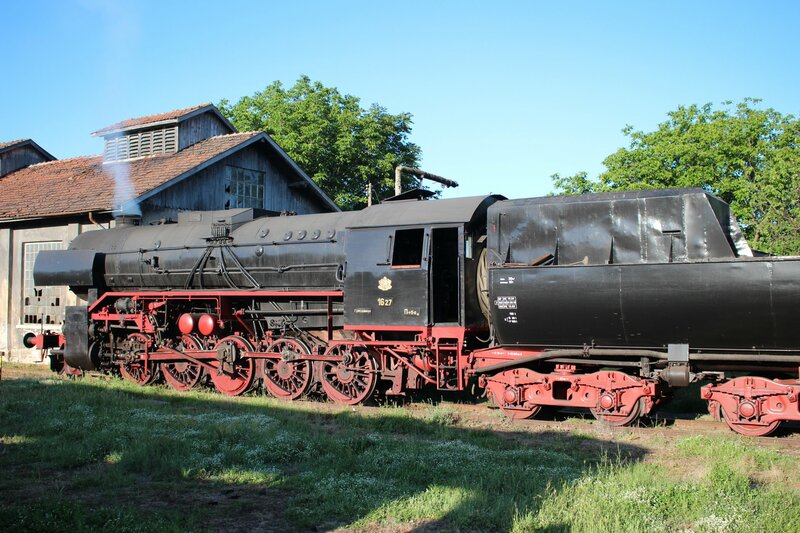 When we turned up at the depot we were delighted to see 05.01 basking in the sun but it soon became clear that there was a problem with the locomotive and that she couldn’t move under her own steam. 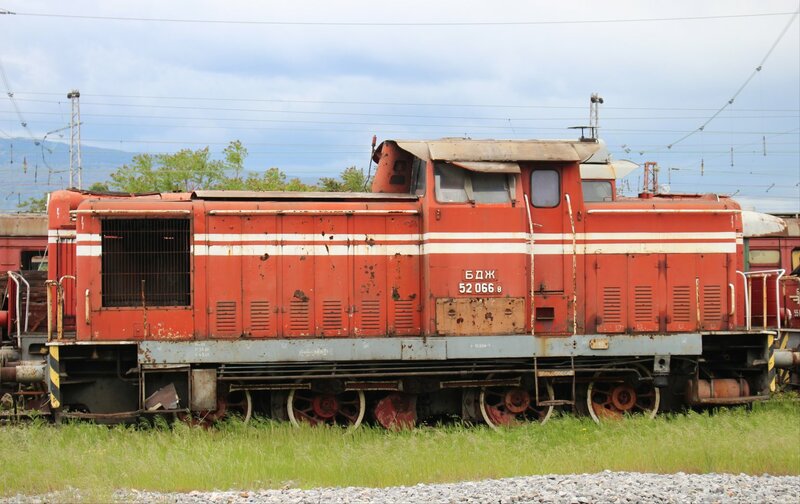 Instead, a diesel shunter was called in to move the locomotive into photo positions on the turntable and on the line from the shed. 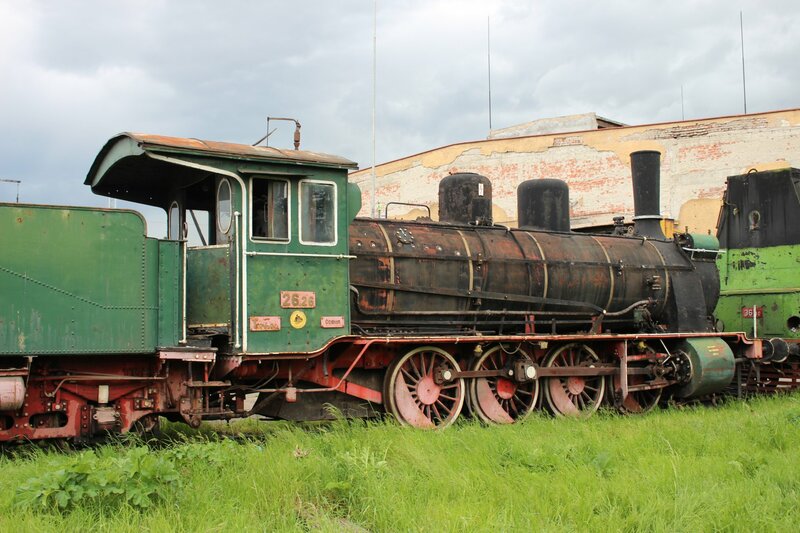 The locomotive had not seen use for nine months before our visit and was working fine when they steamed it up two days before our visit for a test run. It was only when they moved it into position today that they found that they couldn’t close the regulator. Once they finally got it shut they didn’t dare open it again. 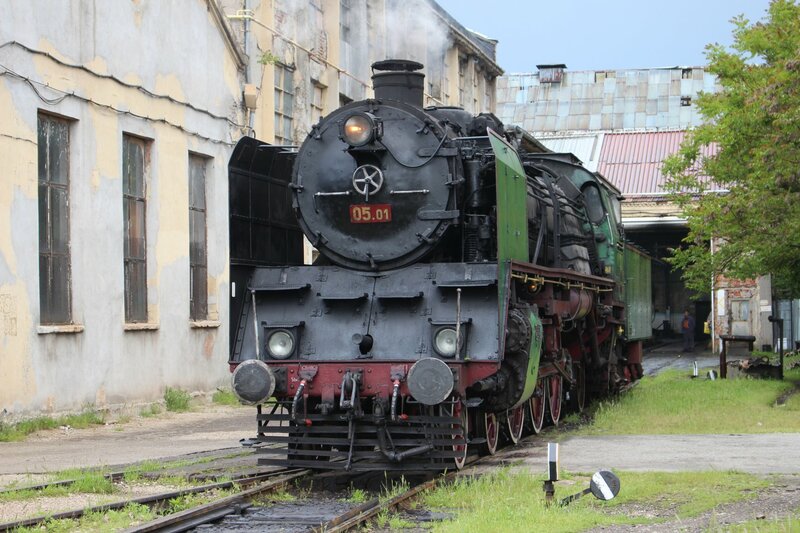 In all honesty, 05.01 wasn’t ever going to do that much in the confines of Sofia Depot so if we have some bad luck on our tour I would much rather it was here than on the longer runs we will be making over the next five days! 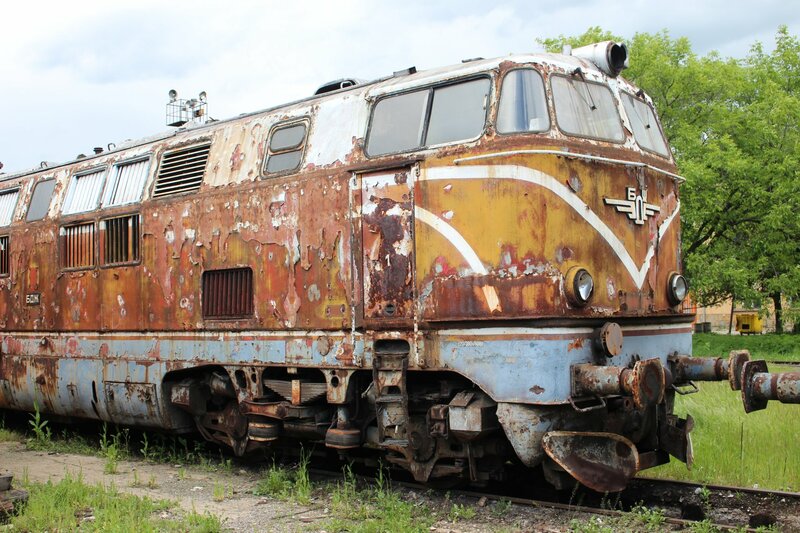 Besides, there was plenty of diesel and electric locomotives to be photographed around the depot along with some other steam survivors lurking inside and outside the shed. Despite the disappointment of not having 05.01 move under her own steam it was still a delight to see this mighty engine up close. 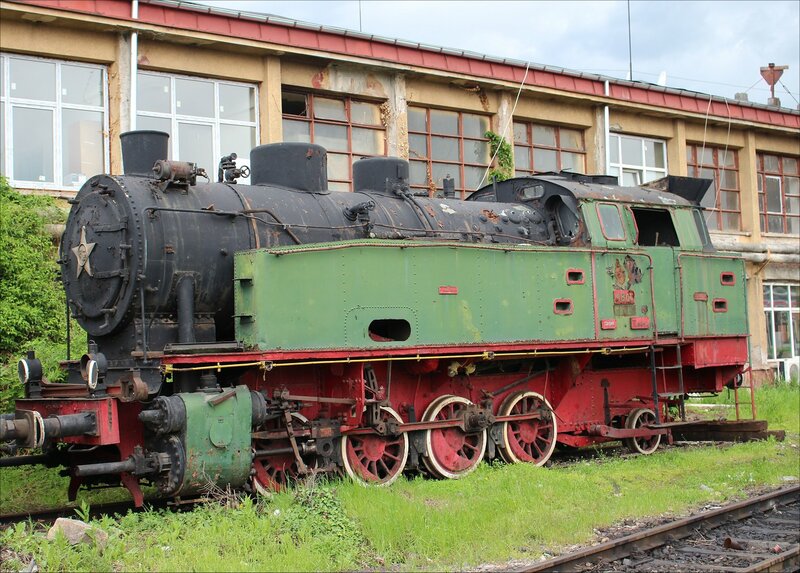 The class 05 steam locomotives were originally commissioned by Bulgarian State Railways (BDŽ) as part of a plan in the 1930s to build a fleet suited to the requirements of the network and the lower quality coal available in the country. 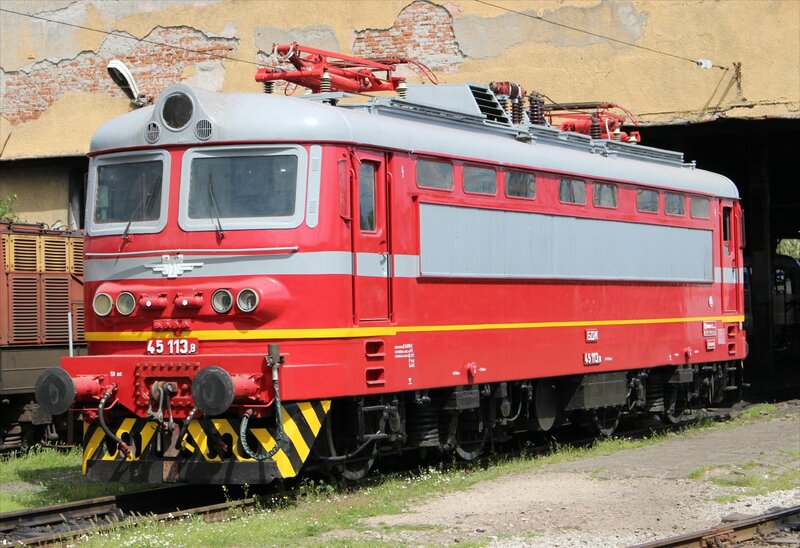 The class 05 locomotives were the fastest steam locomotives to be developed in the history of the Bulgarian railways, principally intended to haul fast and light expresses across flat country. 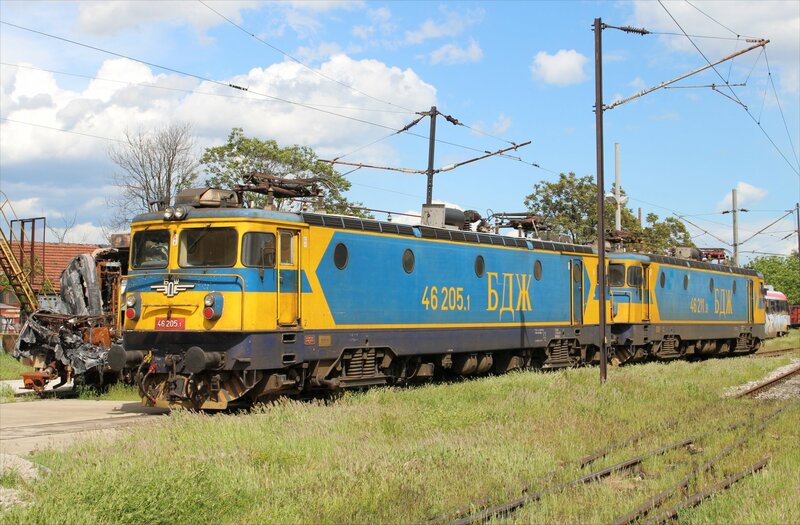 Five class 05 locomotives (originally designated 07 class) were eventually built by the German manufacturer Krupp and delivered in 1941 with the factory numbers 2459-2463. 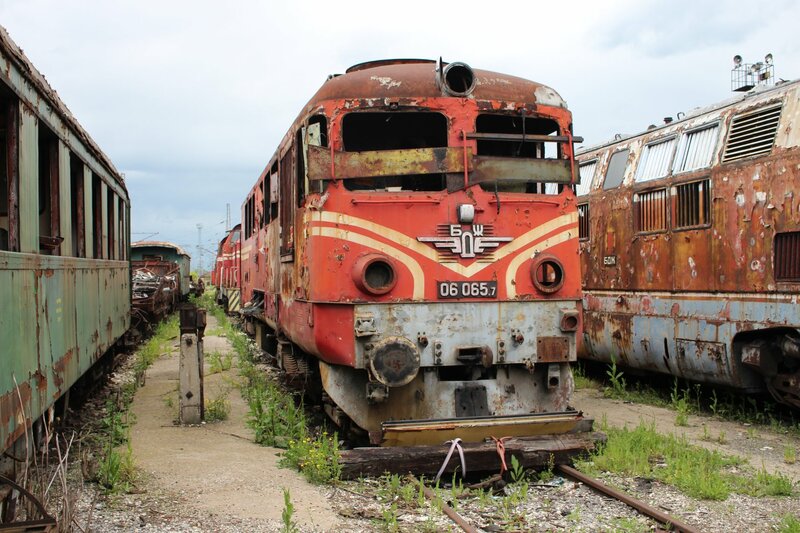 All five locomotives survived the war and were mainly used by BDŽ on express and passenger trains between Stara Zagora and Burgas. 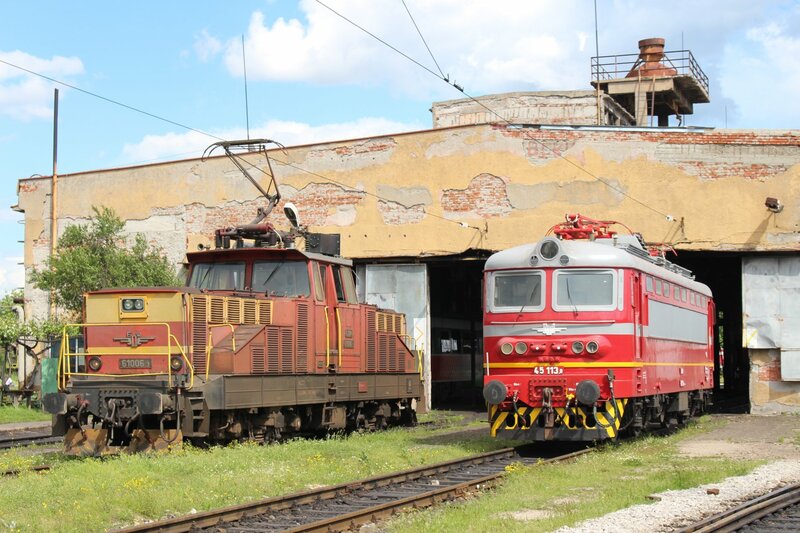 The locomotives were retired in the 1970s, but 05.01 (factory number 2459) was brought to Sofia in 2002 for restoration and returned to operational status in 2010. 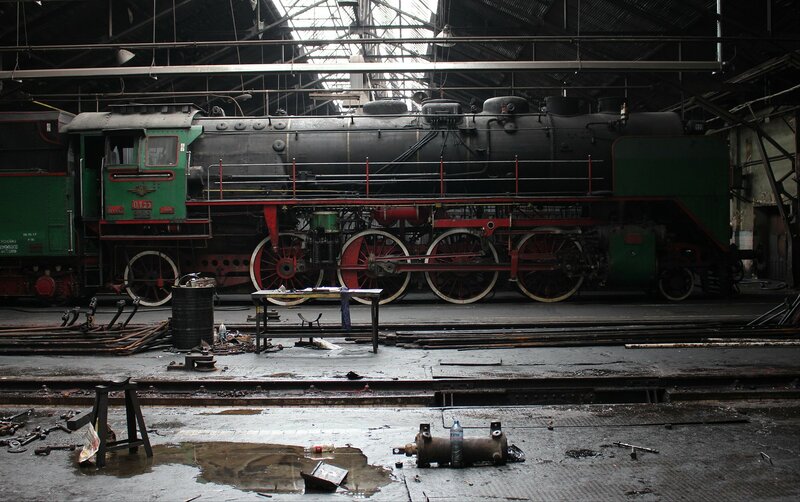 Inside the shed we could see 01.23, an express locomotive built at SLM Winterthur locomotive factory, Switzerland, in 1935. 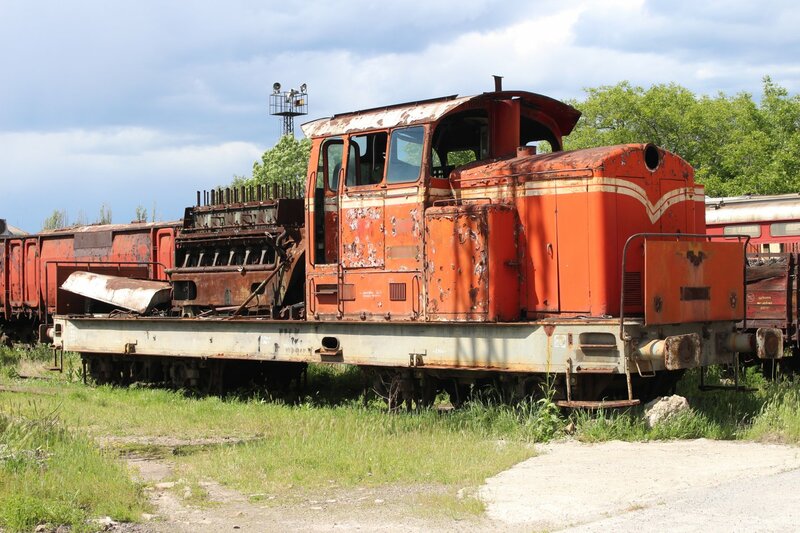 The locomotive was saved for preservation in 1979 as the last of her class and has since been restored. 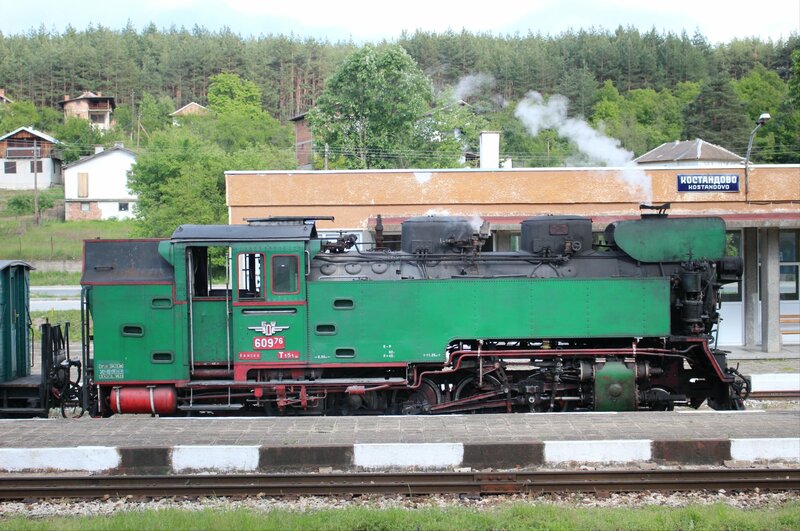 At the moment she is in the works for an assessment of her boiler after a lengthy spell in operation. 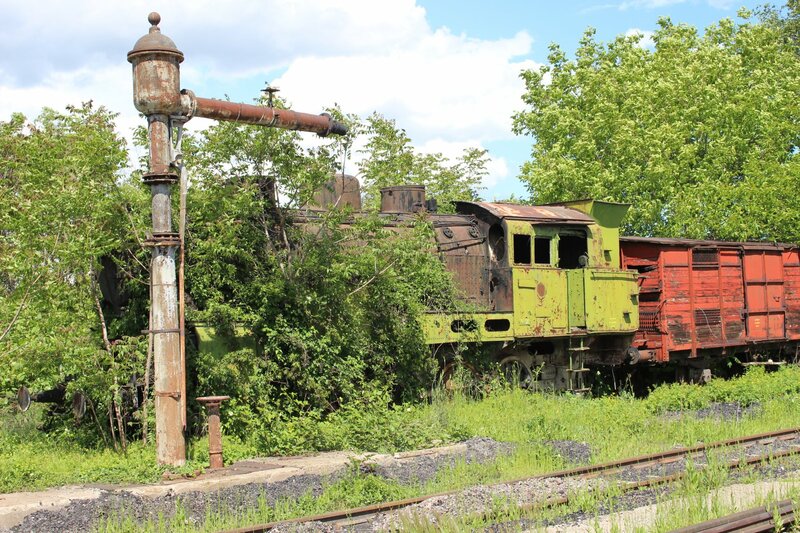 The three steam locomotives located immediately outside the shed were 26.26, 36.10 and 48.04 with a fourth engine heavily camouflaged by vegetation on the far side of the turntable. 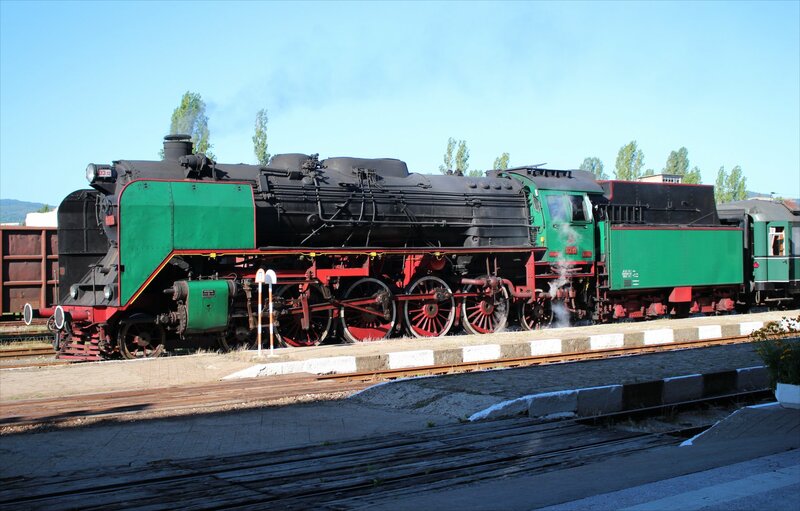 Arrived in Sofia this afternoon, ready to join up with a steam photo charter tour in southern Bulgaria organized by Dietmar Kramer with Ulpia Tours. 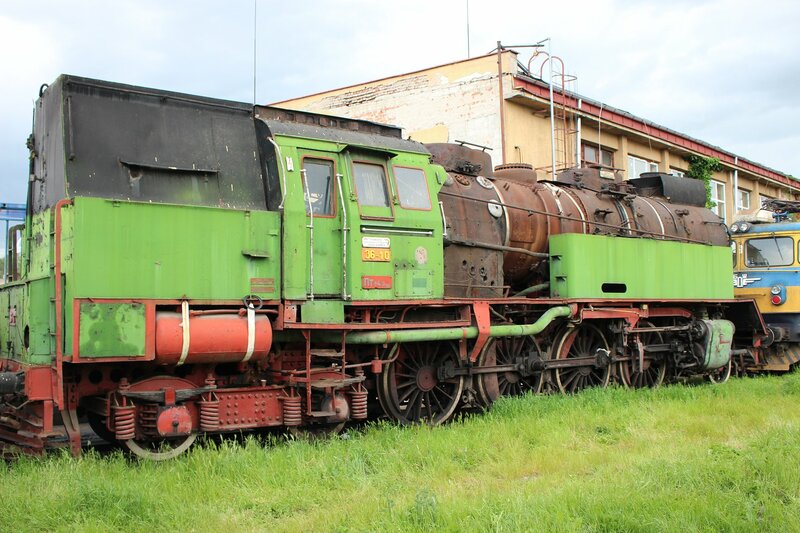 The charter will utilise five operational steam locomotives and probably give us sight of many more lurking in the weeds, in the works or on plinths (the first example being 47.05 on display at Sofia Central Railway Station). 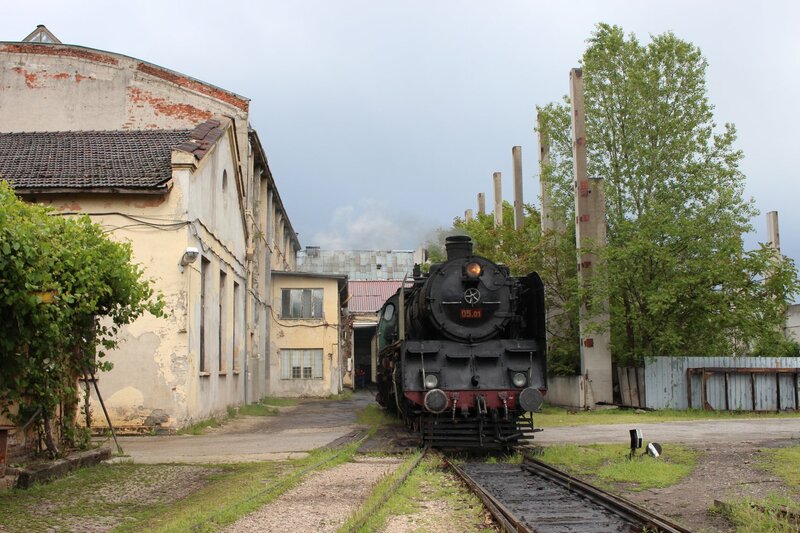 Our photographic adventures begin tomorrow with a visit to Sofia shed before we move on to the stretch of line between Haskovo and Podkova in the Eastern Rhodopes. 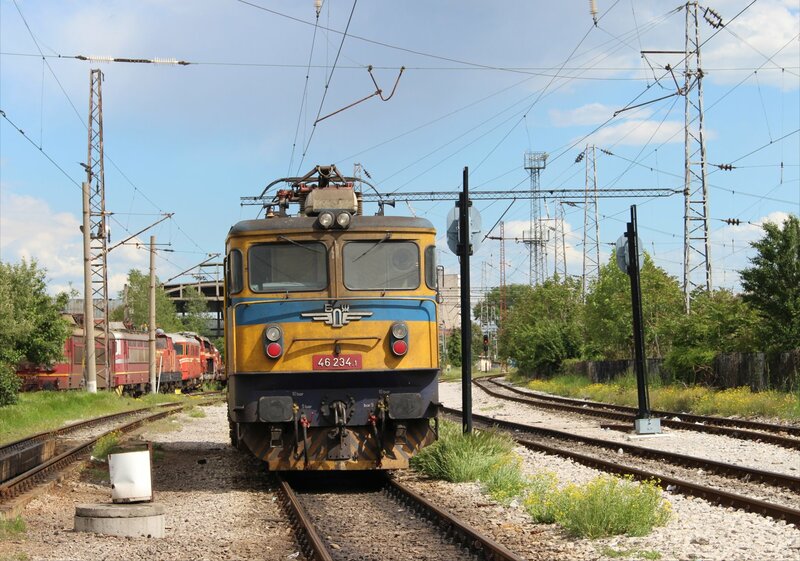 Our final day will take us part way down the scenic narrow gauge line in the Western Rhodopes from Septemvri to Velingrad. 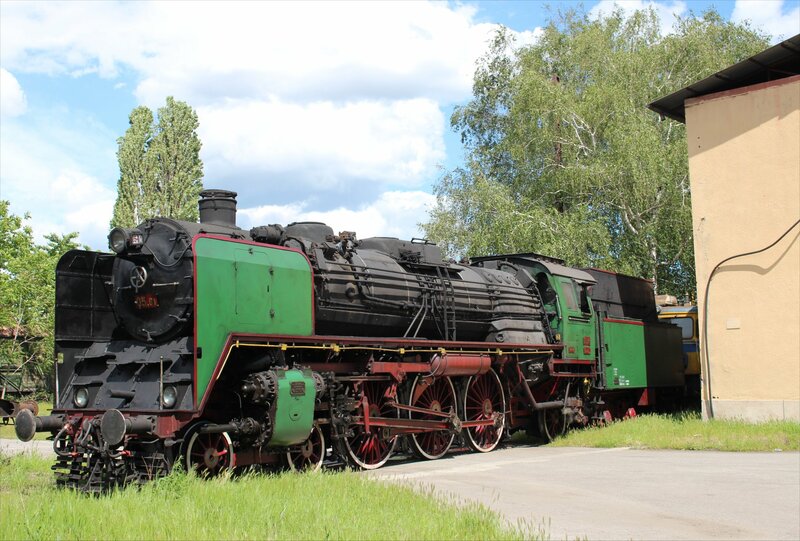 The principal attraction for the tour is the remarkable 46.03, one of the largest tank engines ever to be constructed in Europe (built by H. Cegielski of Poznań in 1931) which joined the BDŽ fleet of operational steam locomotives in May 2015. 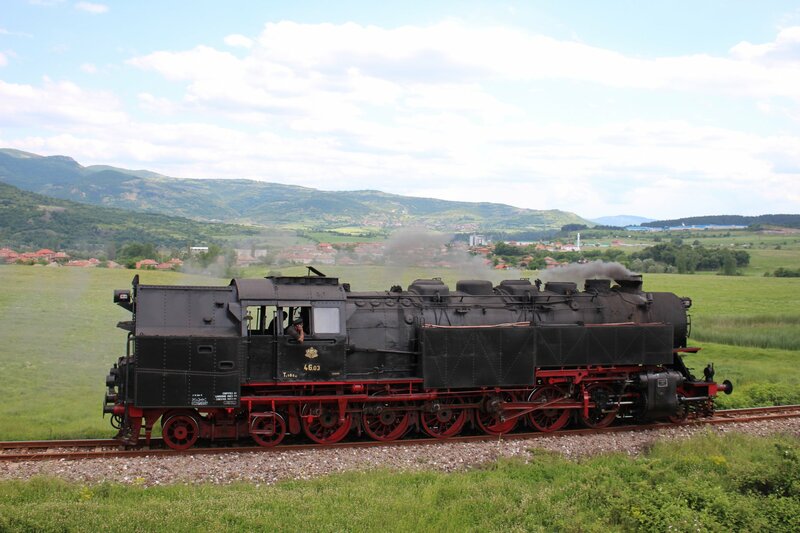 The class 46 2-12-4 tank locomotives were originally intended to haul heavy coal trains through the mountains, so our three carriage train ought to be a relatively easy challenge!